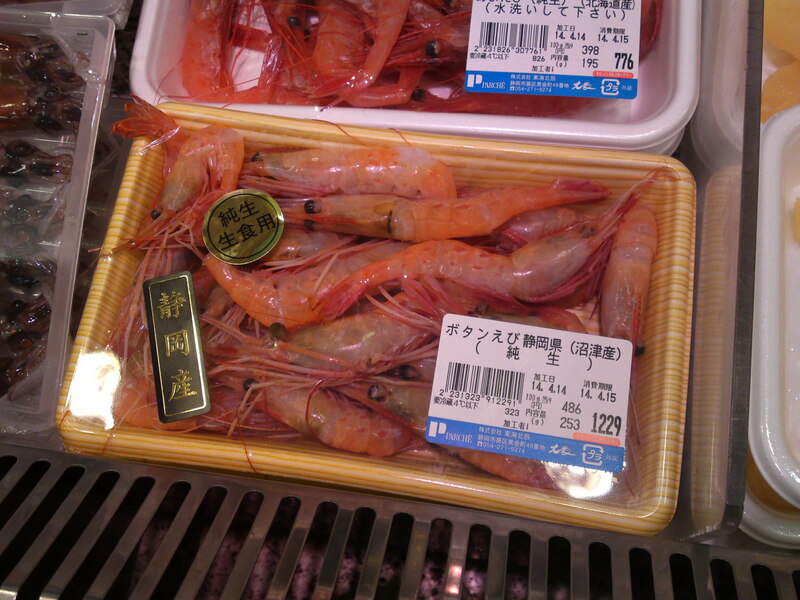 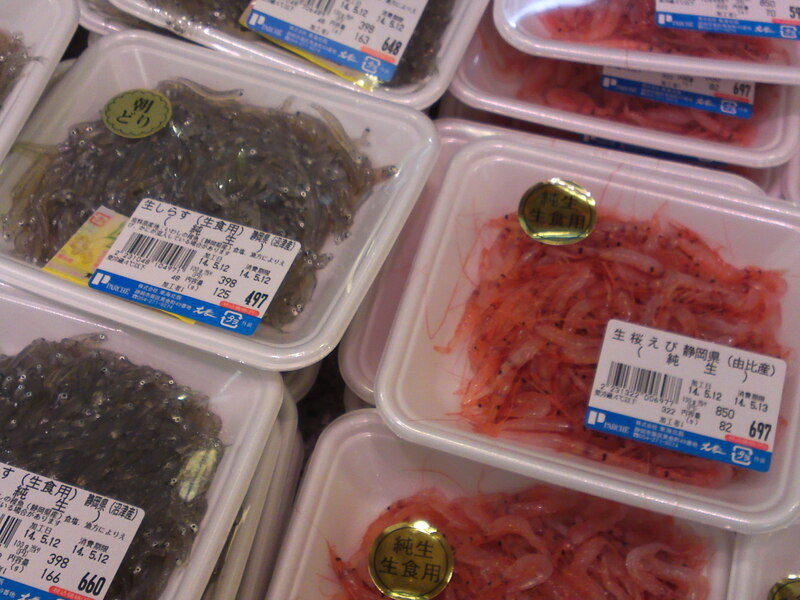 More Seafood and Fish at Parche Supermarket in Shizuoka City:!-And Botan Shrimps! 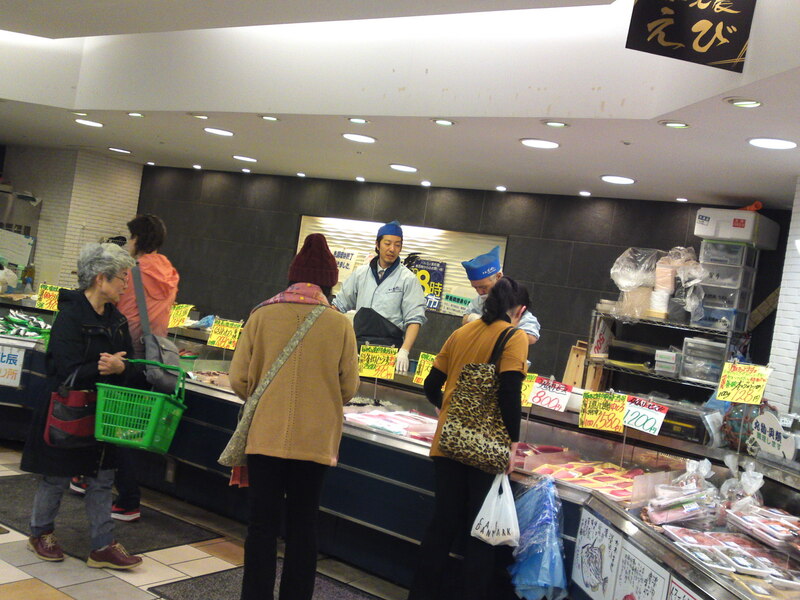 This the latest visit to the Shizuoka JR Station Parche supermarket in my regular search for seasonal and local seafood arriving directly every morning for the harbors of Numazu, Kogawa, Yui, Omaezaki, Mochimune, Shimoda and many others! 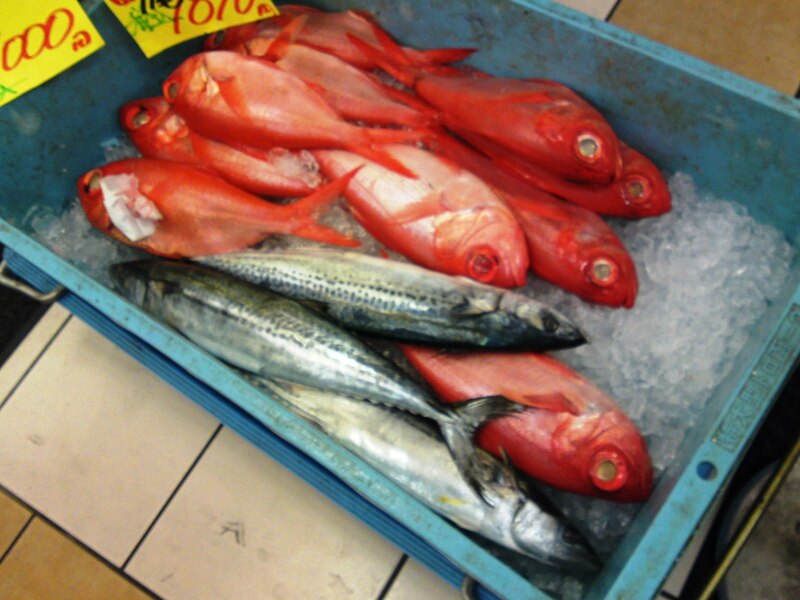 What did I find worthy of attention this first day of the week? 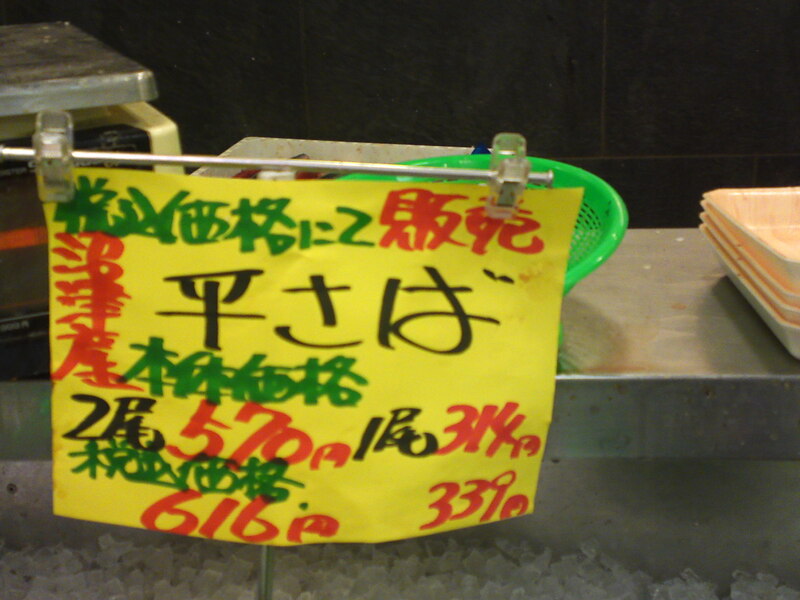 First of all the mixed batch of the day! 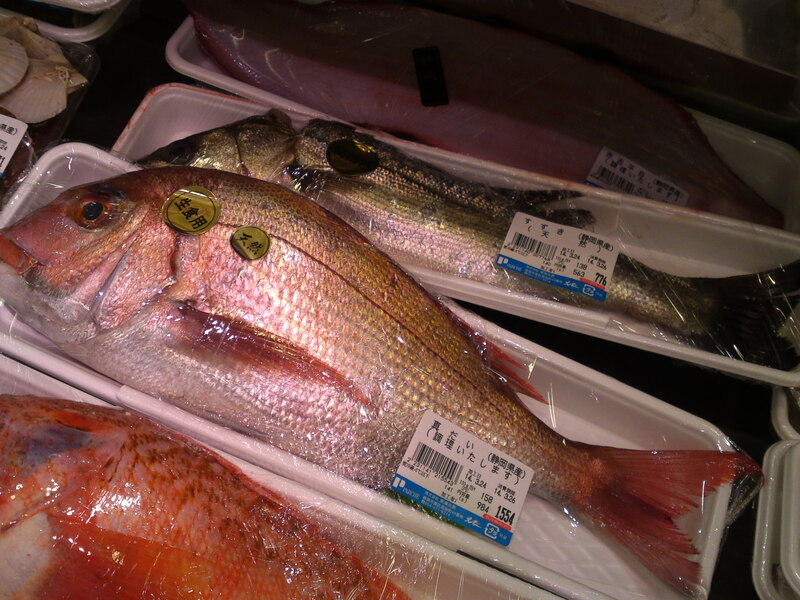 Hirame/平目/Sole, Madai/真鯛/Japanese red seabream, Magochi/真ゴチ/Flathead, Houbou/方々/Red Robin Gurnard, Kurodai/黒鯛/Japanese black porgy, Mejina・メジナ/Largescale Blackfish、Ishi kasago/居市カサゴ/A variety of rockfish, Ishidai/石鯛, Barred Knifejaw! 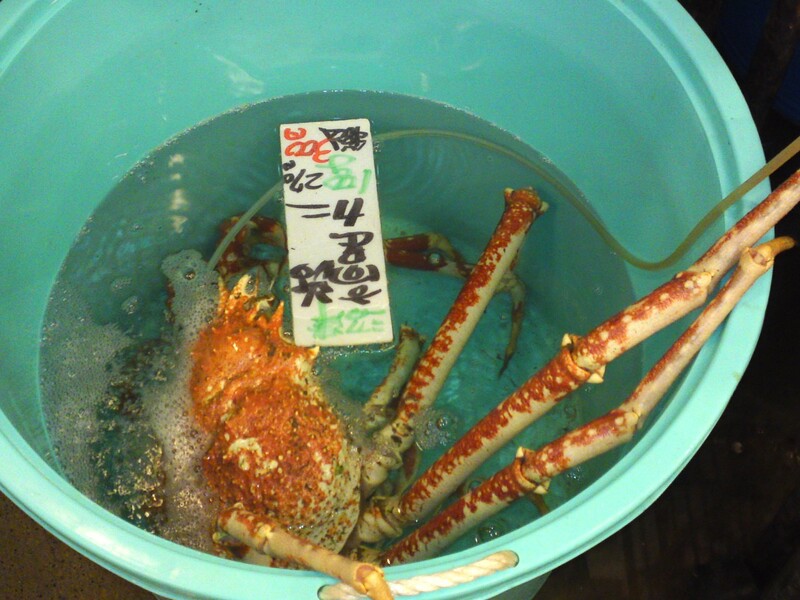 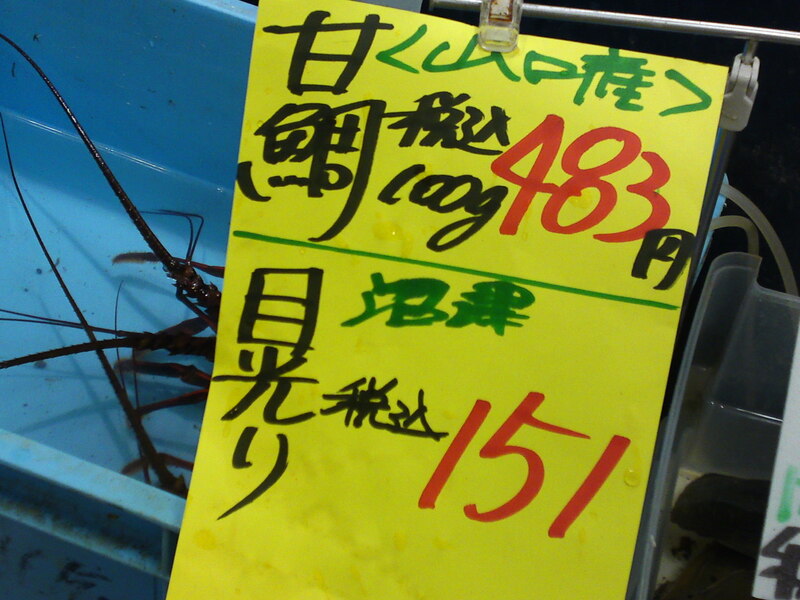 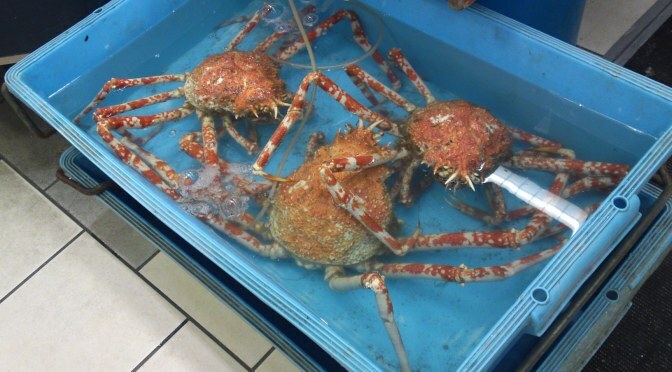 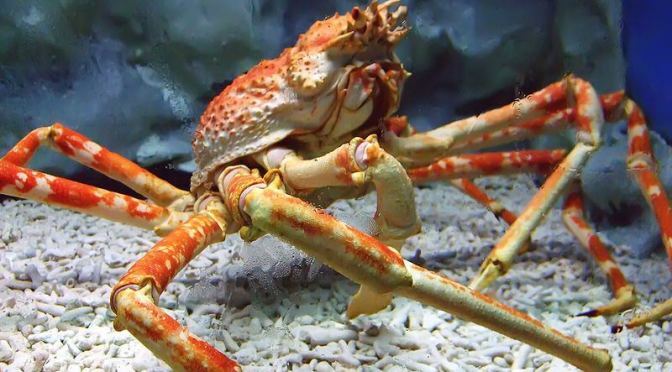 Takahashigani/高足蟹/Japanese Spider Crab from Numazu harbor! 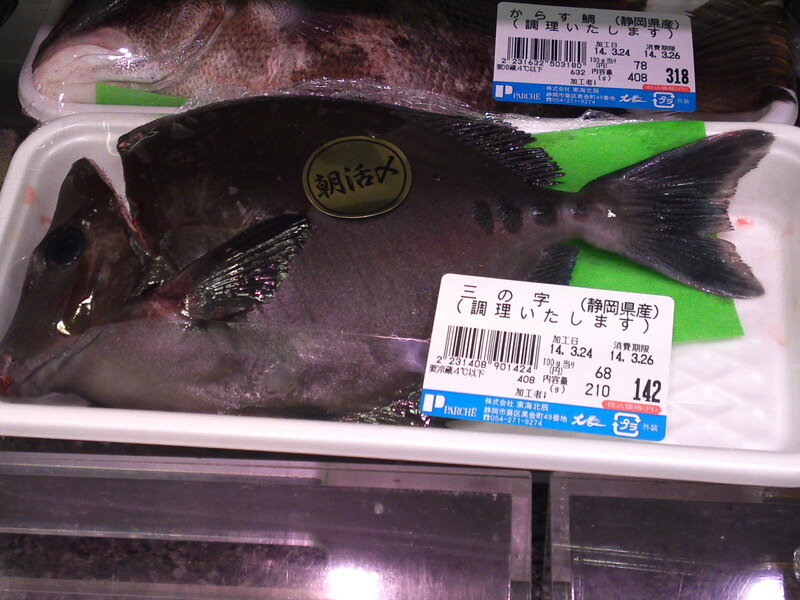 An expensive and a rare fish! 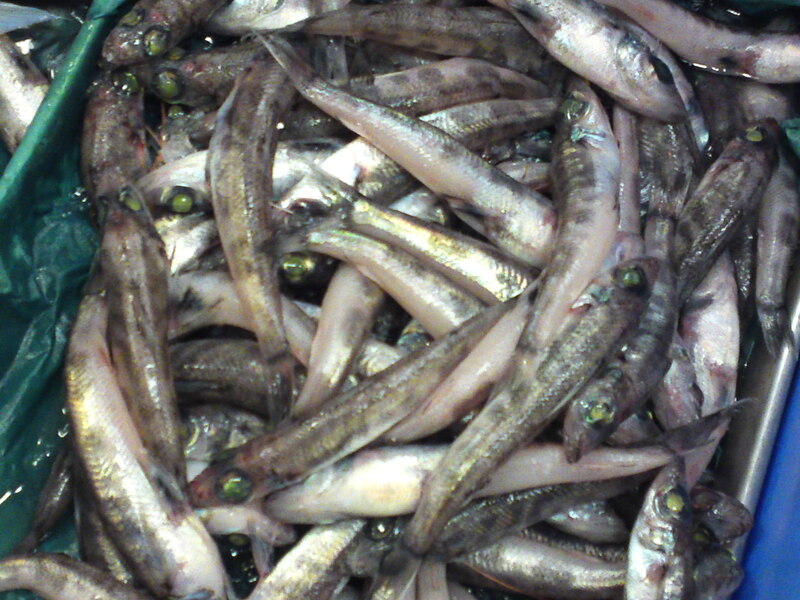 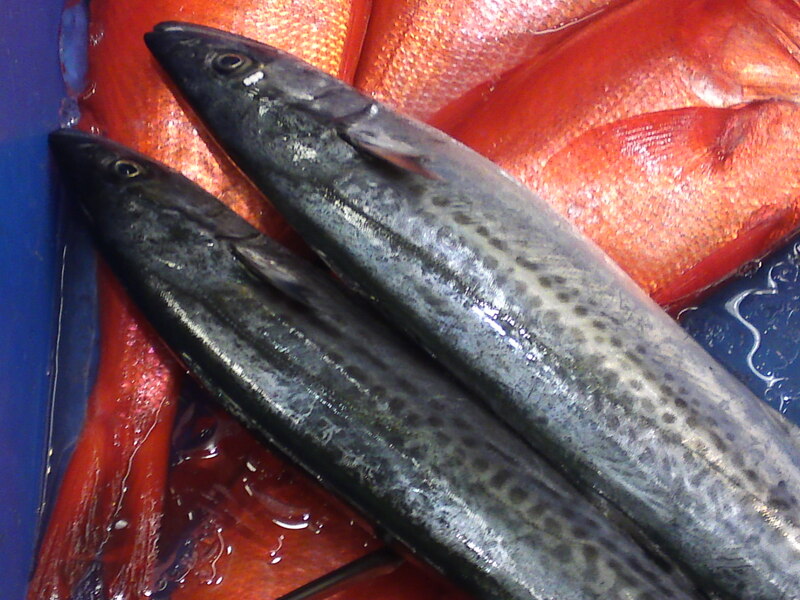 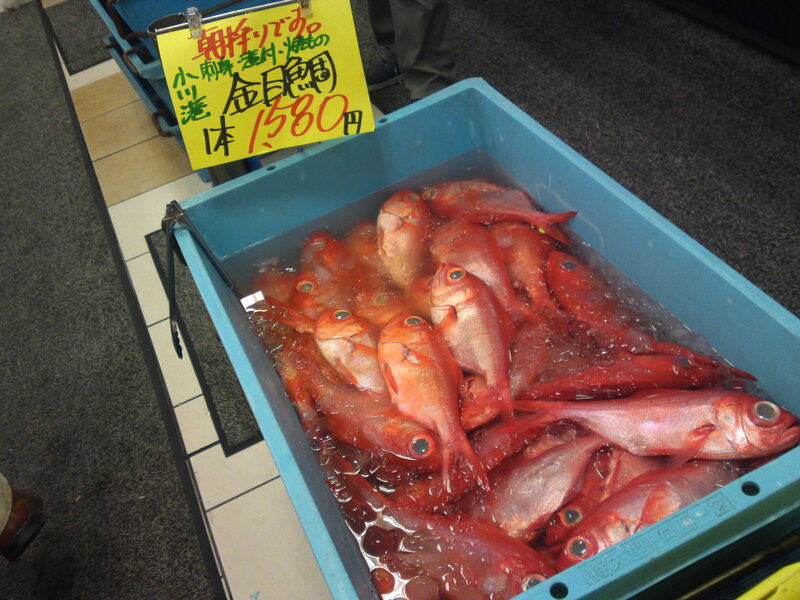 Mehikari/目光り/”Shining eyes”, a very deep sea fish caught in Eastern Suruga Bay! 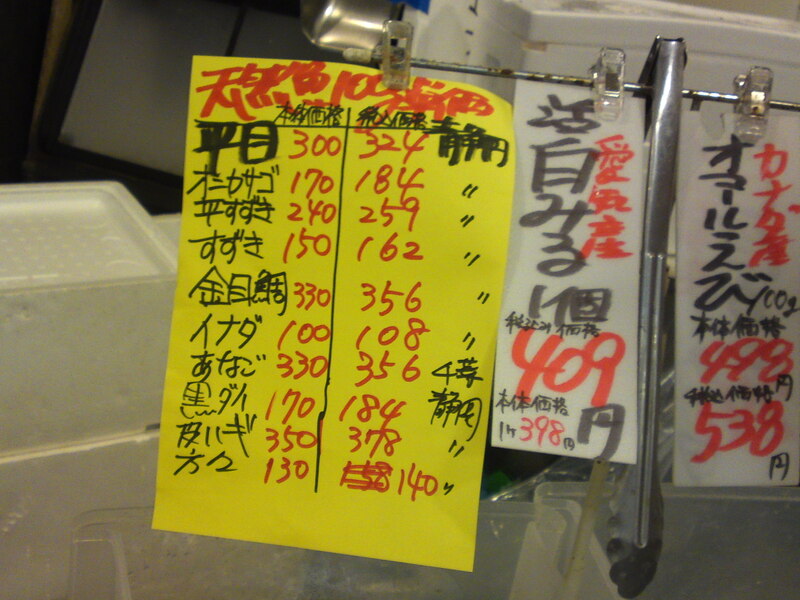 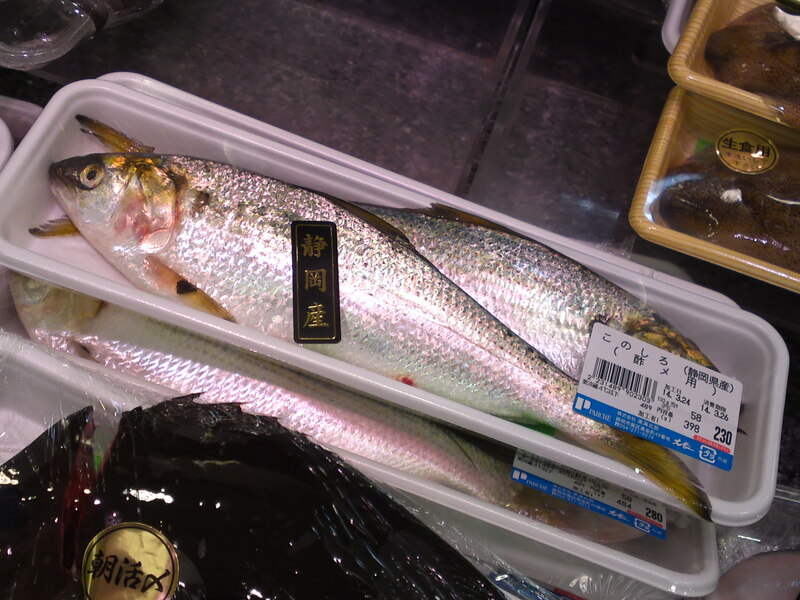 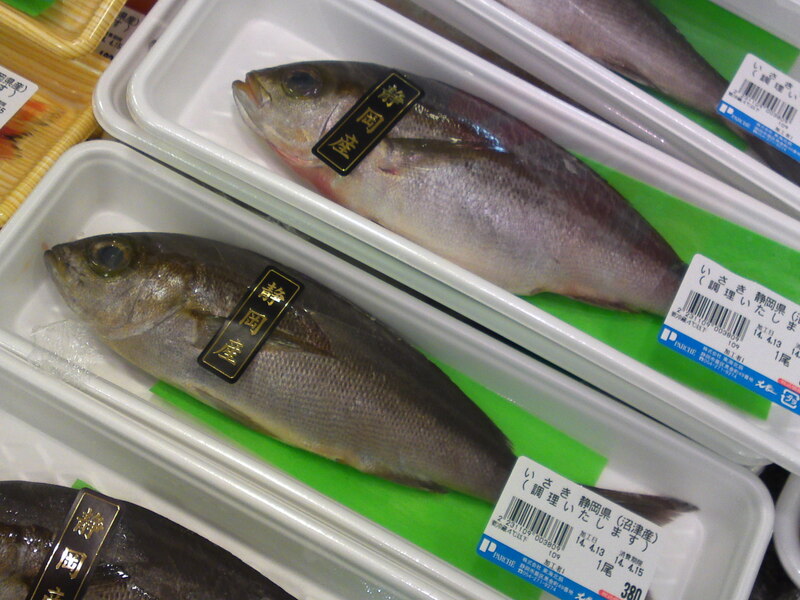 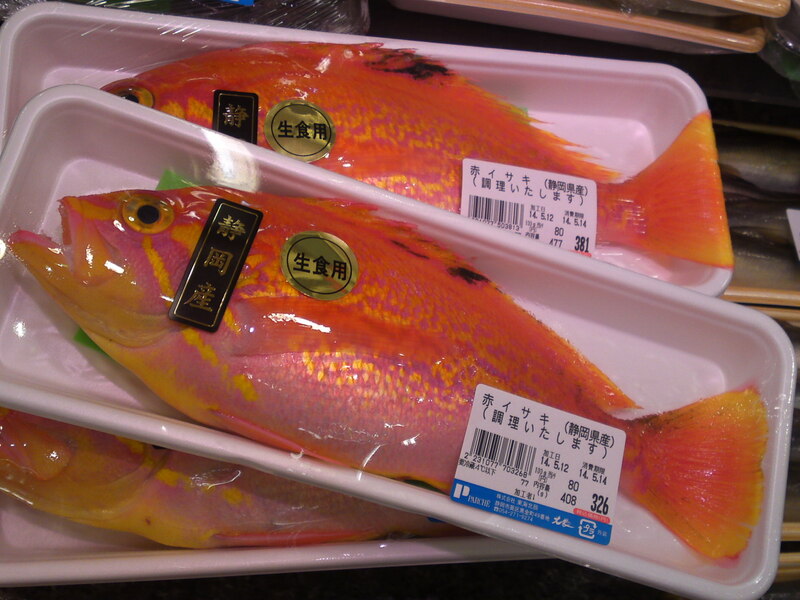 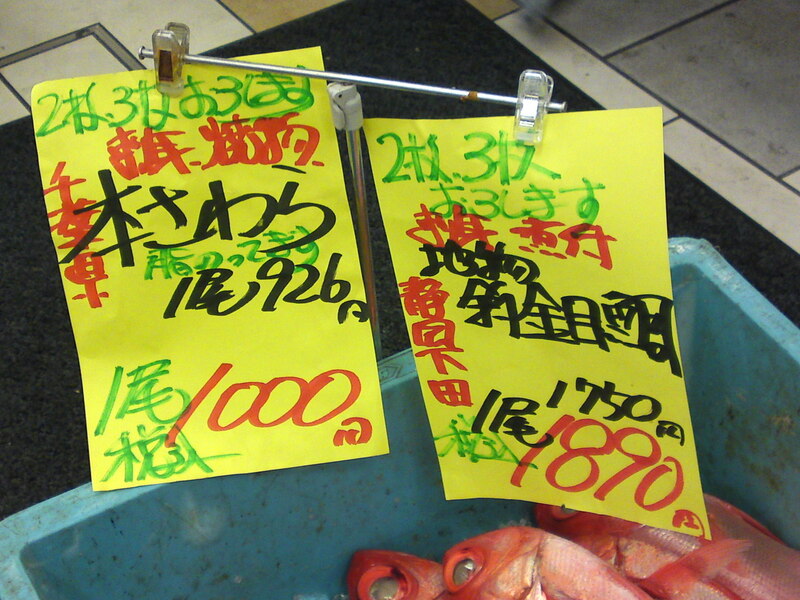 The top price per 100 grams is for tilefish on top and mehikari at bottom! 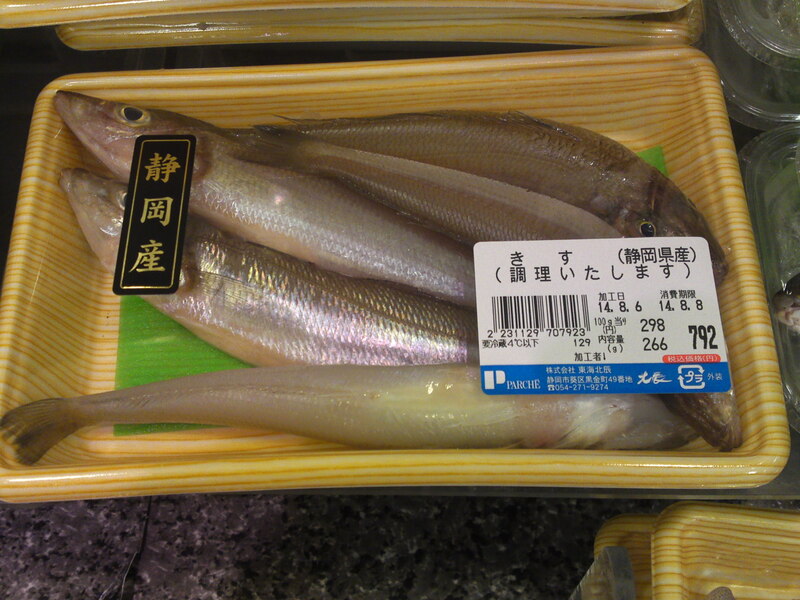 From Yui harbor! 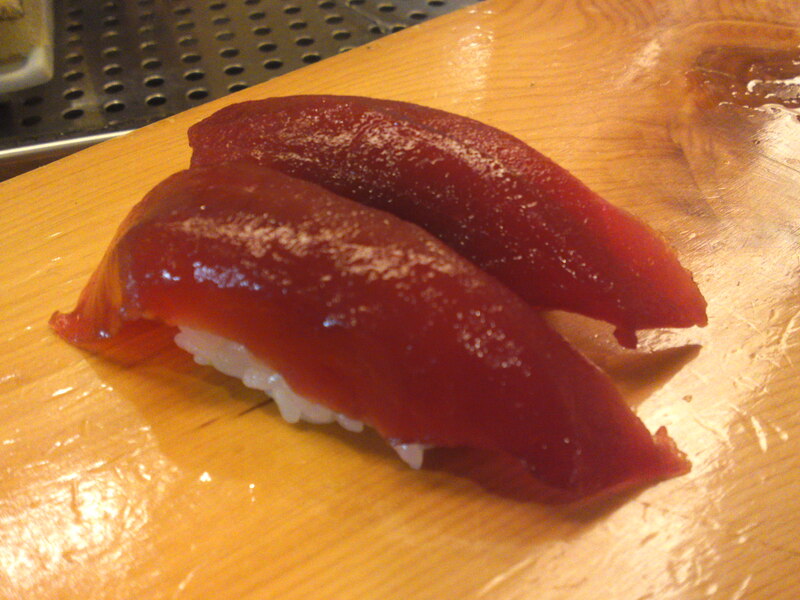 Great sashimi! 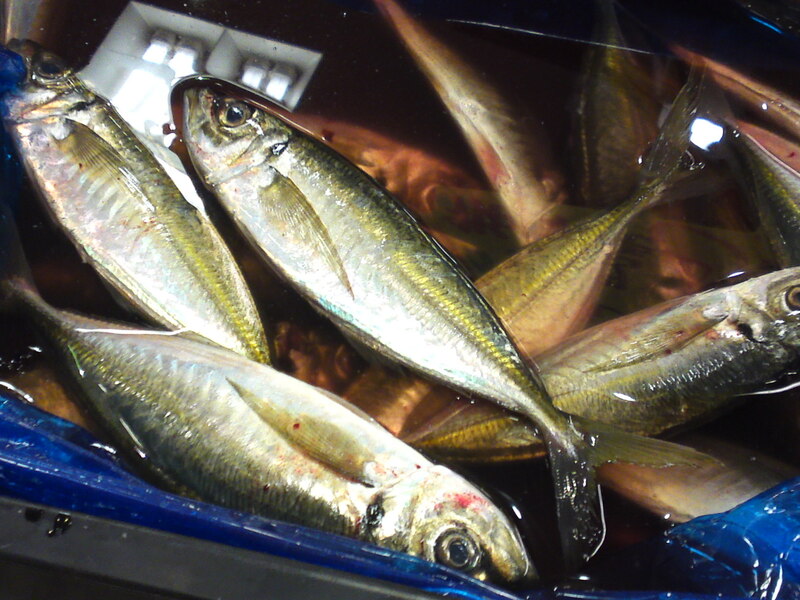 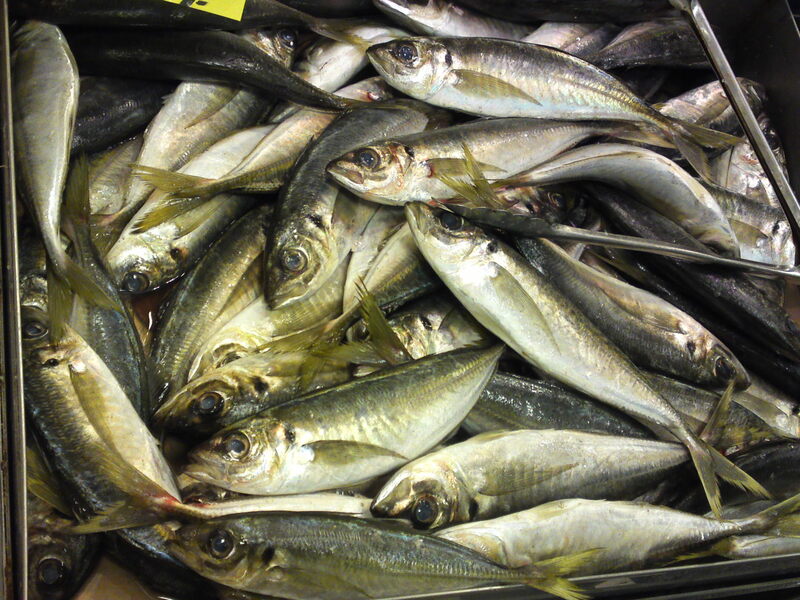 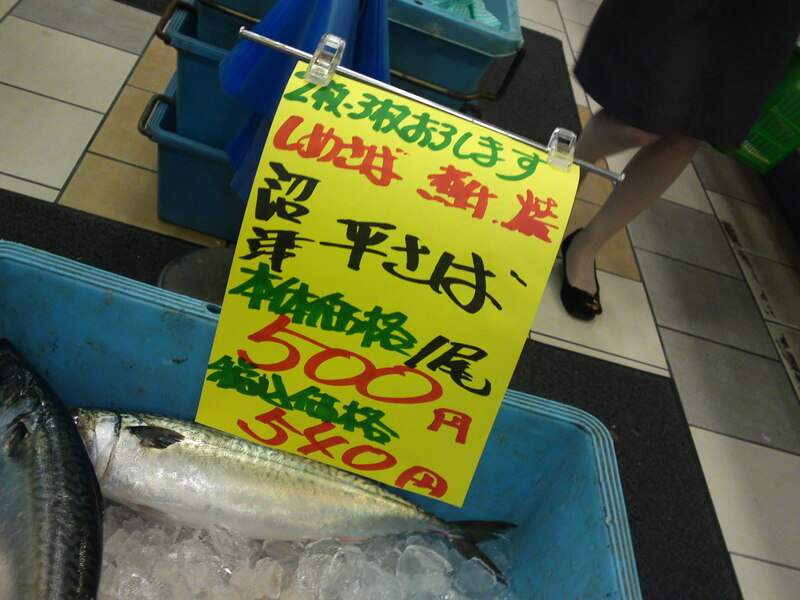 Maaji/真あじ/Japanese jack mackerel from Yui! 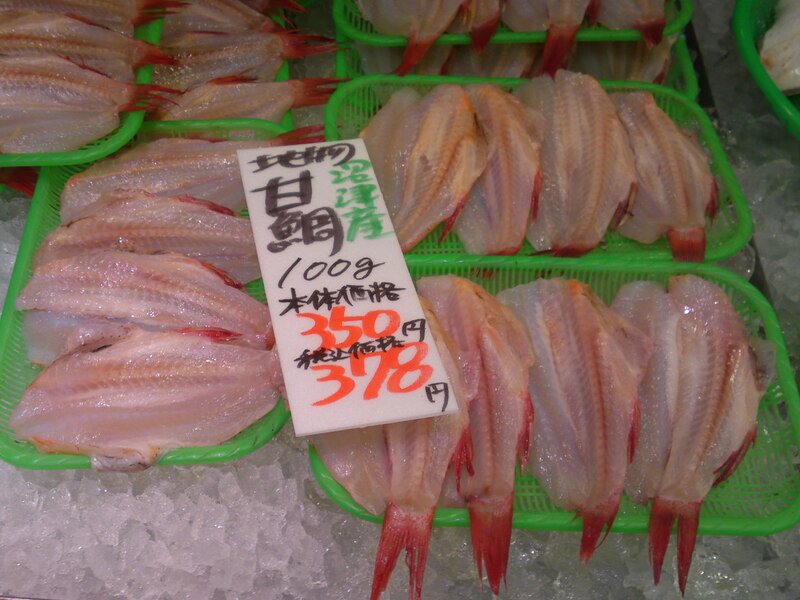 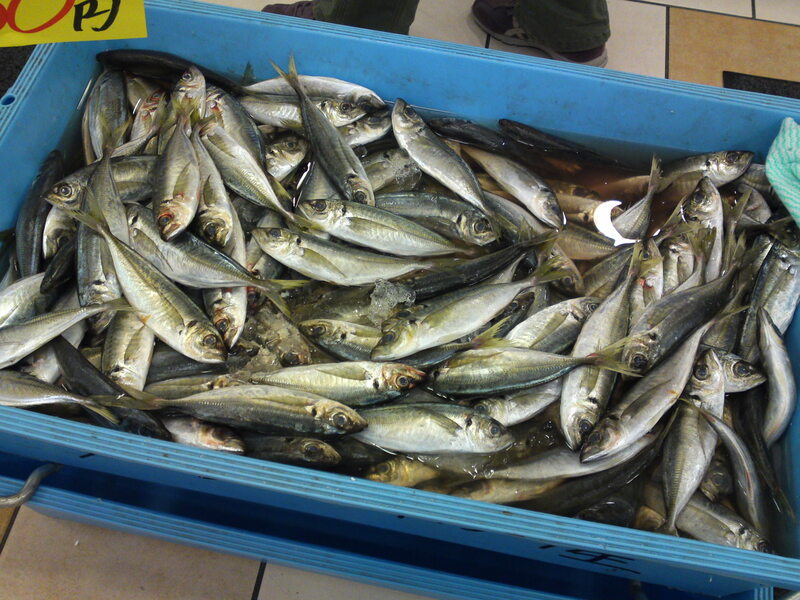 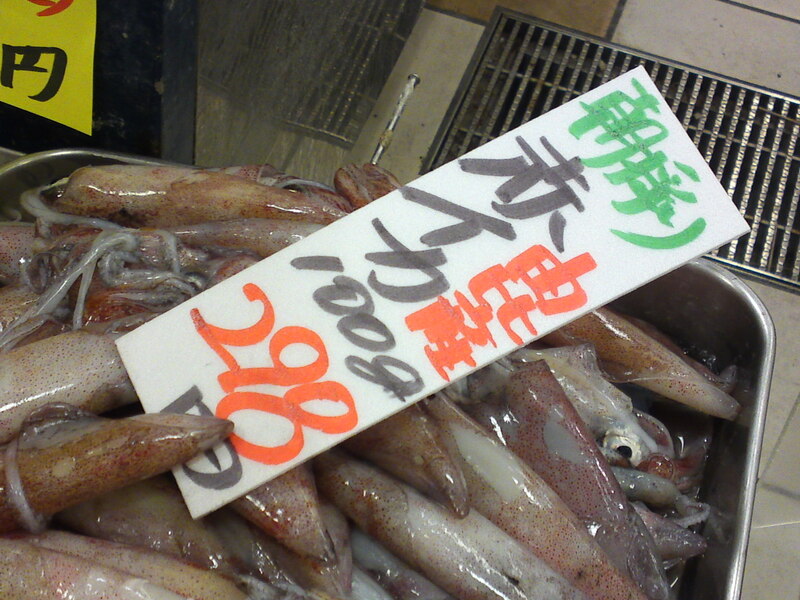 Caught this morning and more expensive as the price is for only 100 grams! 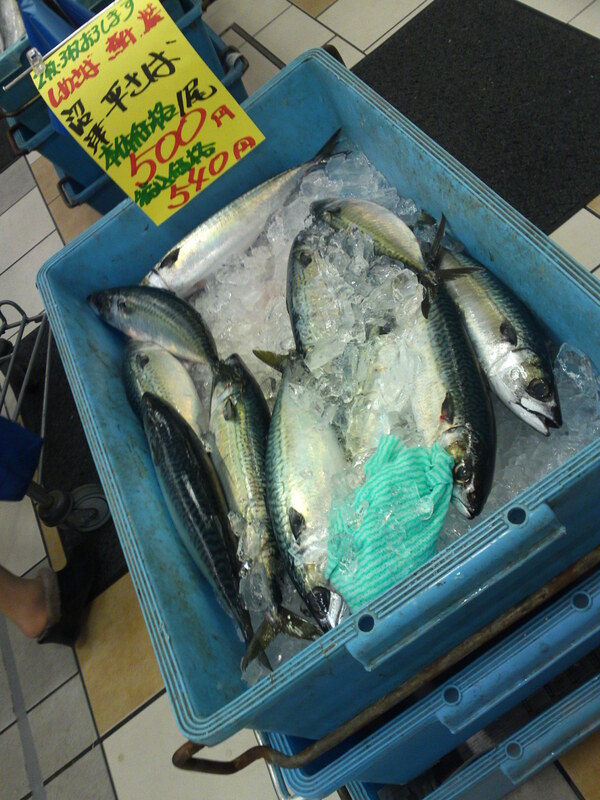 Very big specimen for Sardines! 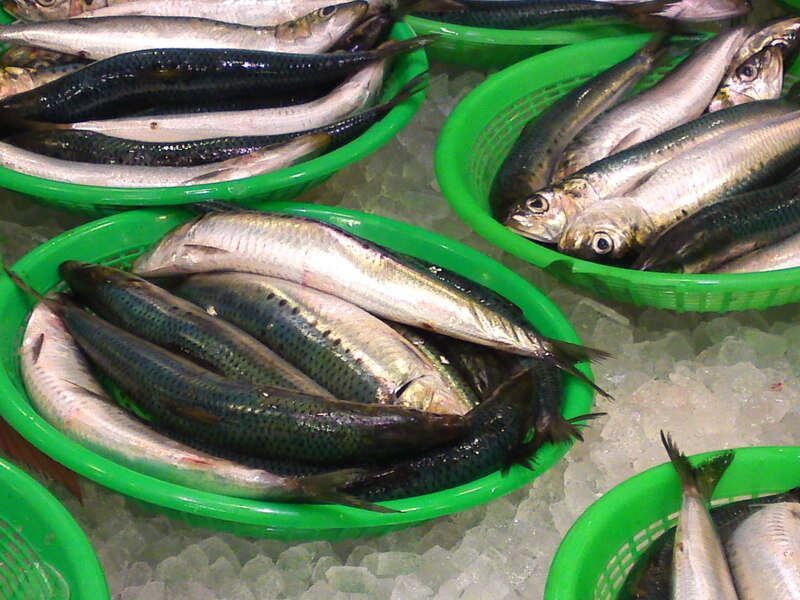 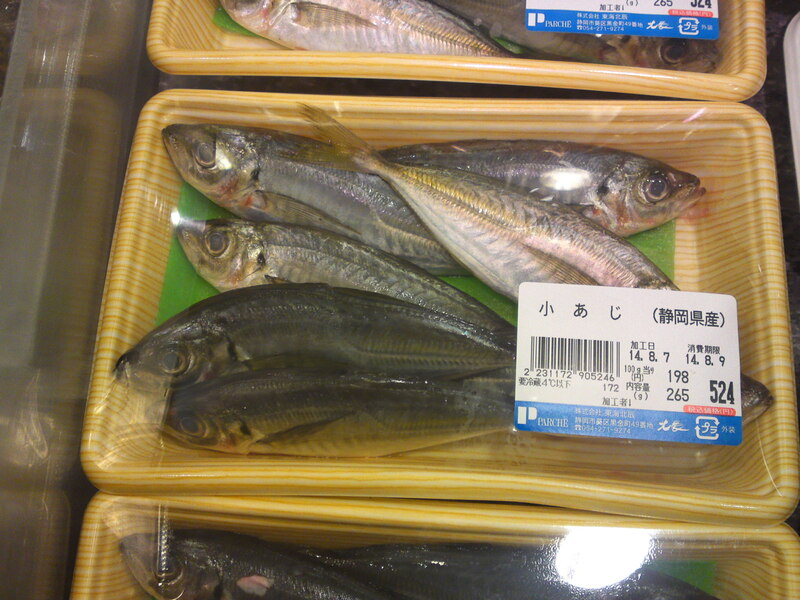 They come from Numazu Harbor and they are called Maiwashi/真鰯/Japanese pilchard! 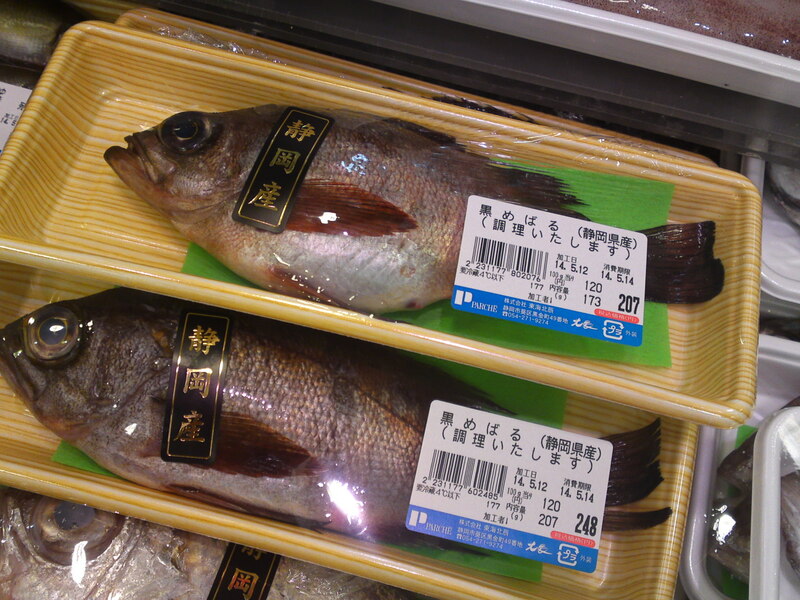 One fish is from Shizuoka Prefecture, the other from Chiba Prefecture! 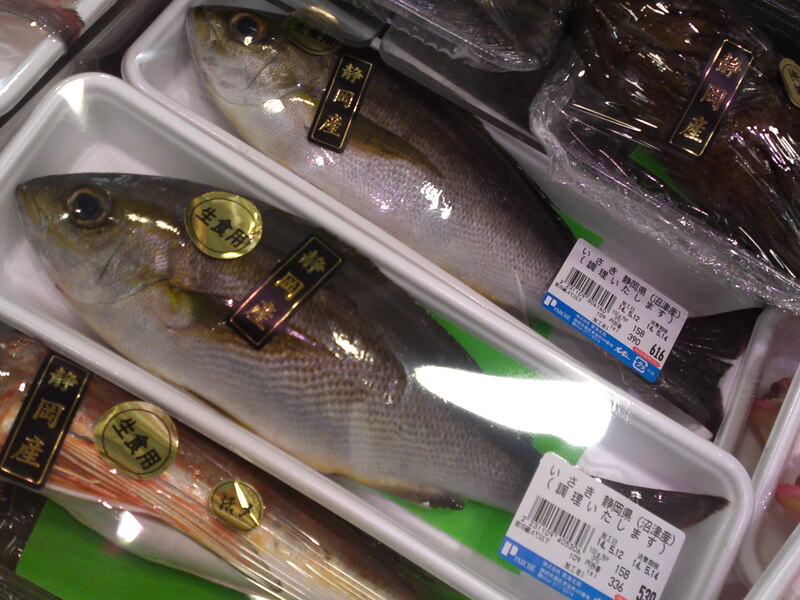 The black one is Honsawara/本さわら/Japanese Spanish mackerel and the red one, Kinmedai/金目鯛/Splendid Alfonsino from Shimoda harbor! 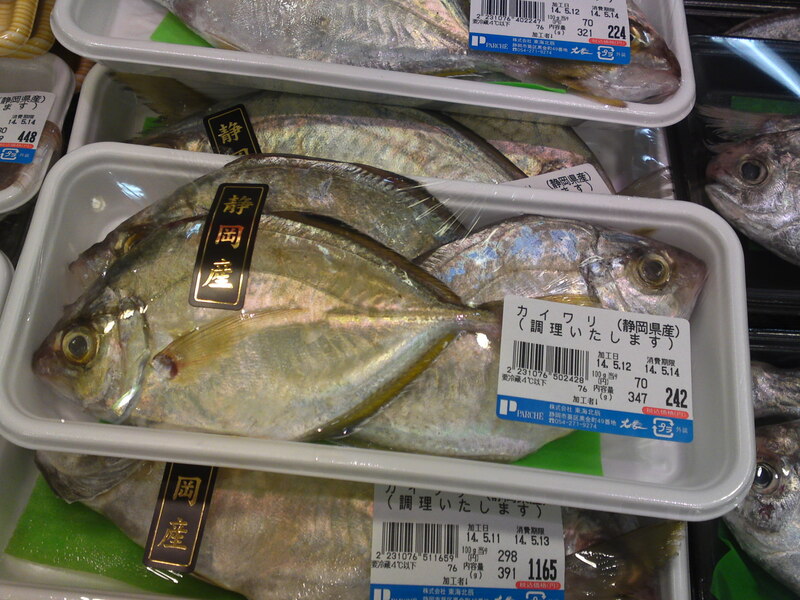 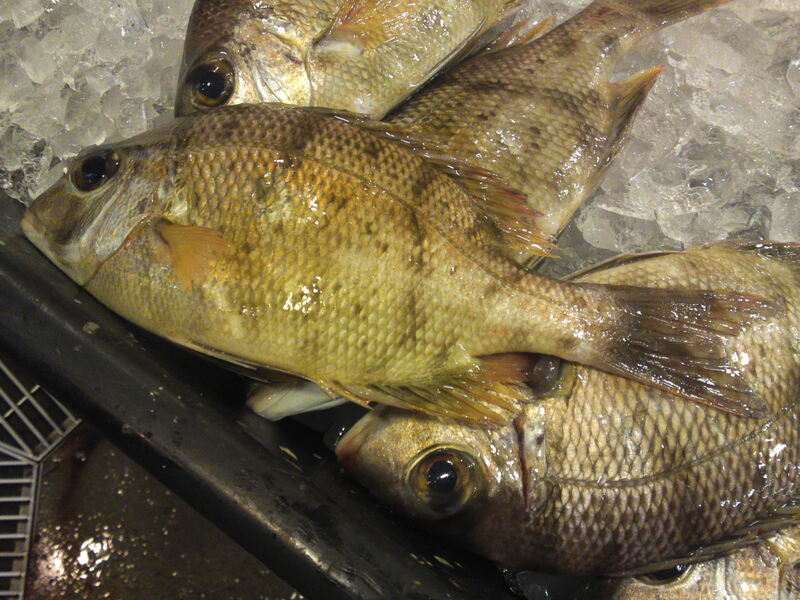 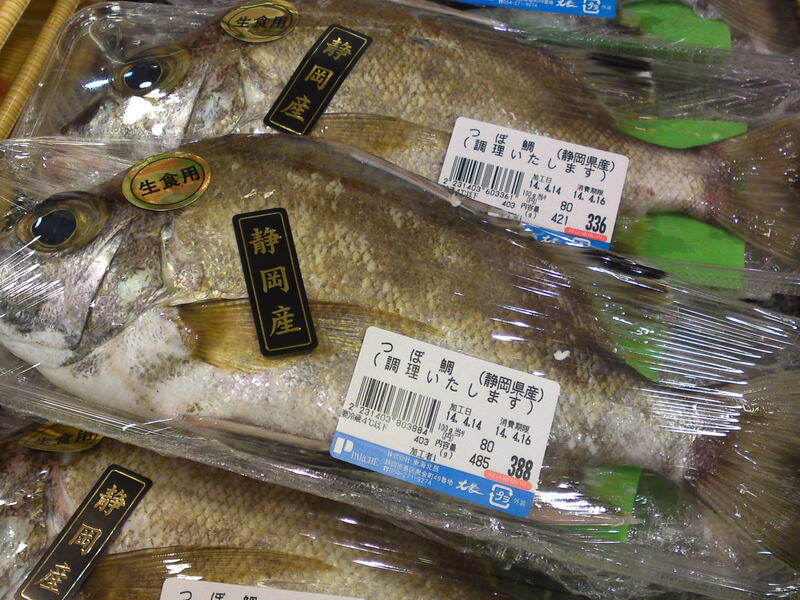 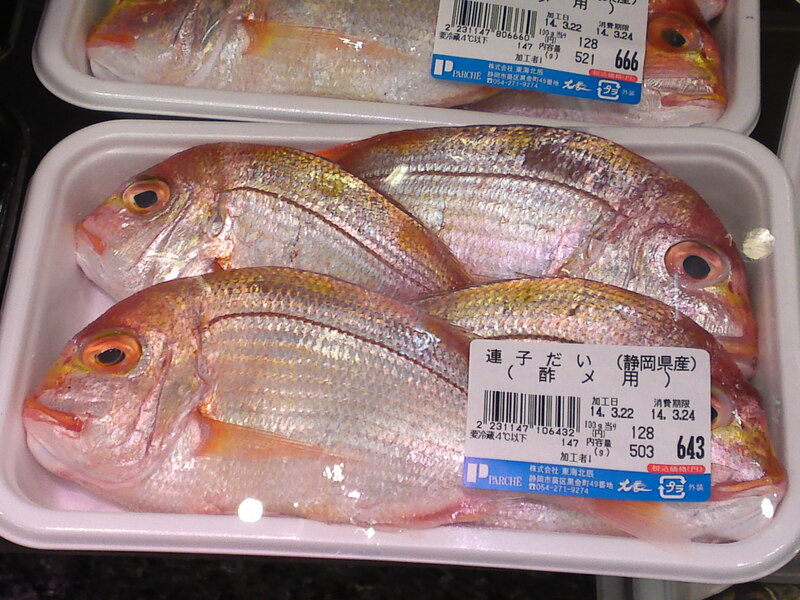 Tsubodai/つぼ鯛/A seabream variety going by the Latin name of Pentaceros japonicus Doderlein! 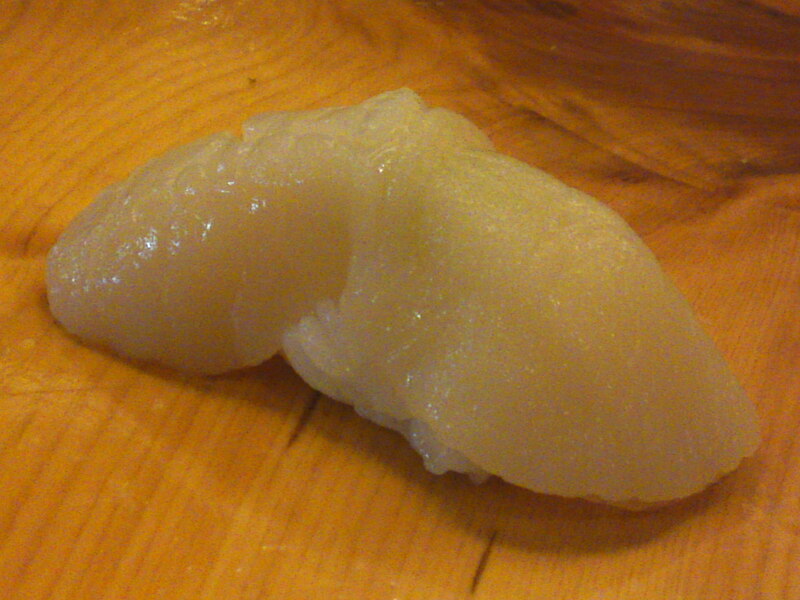 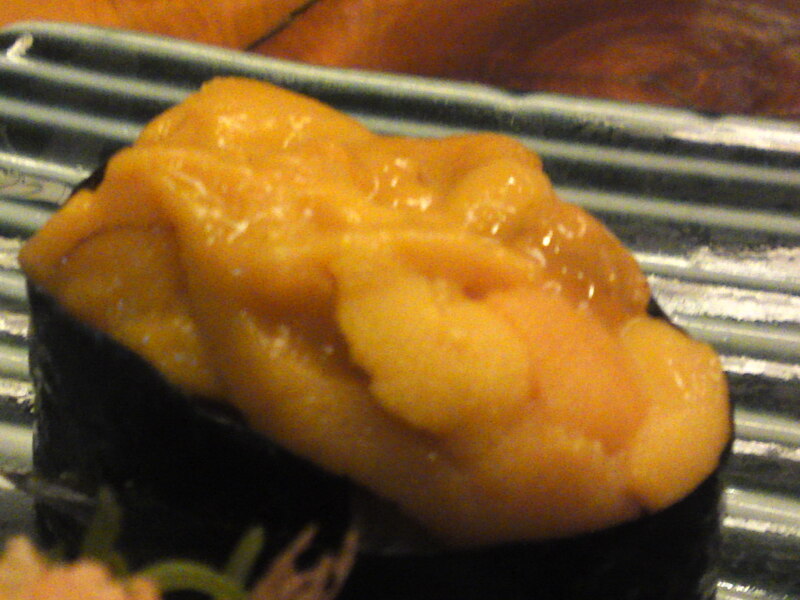 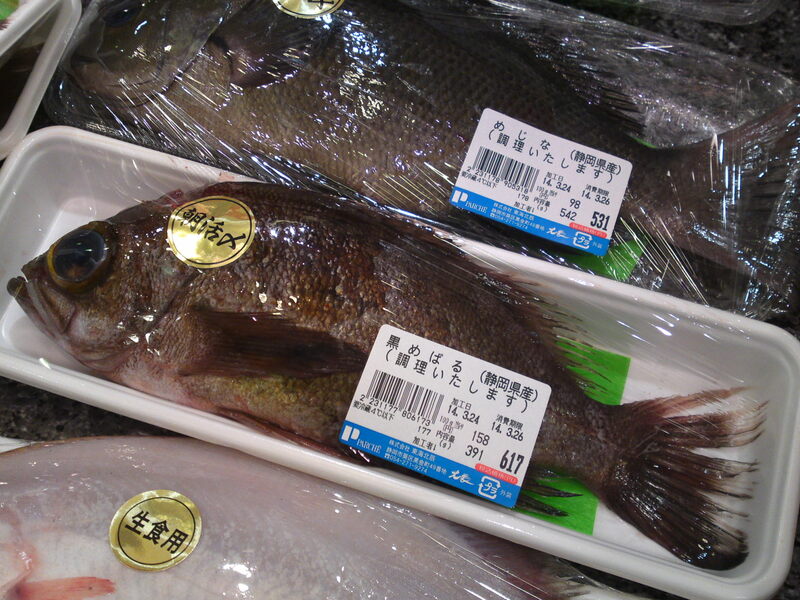 Isaki/いさき/A typical fish from Shizuoka Prefecture going by the strange English name of Chicken grunt! 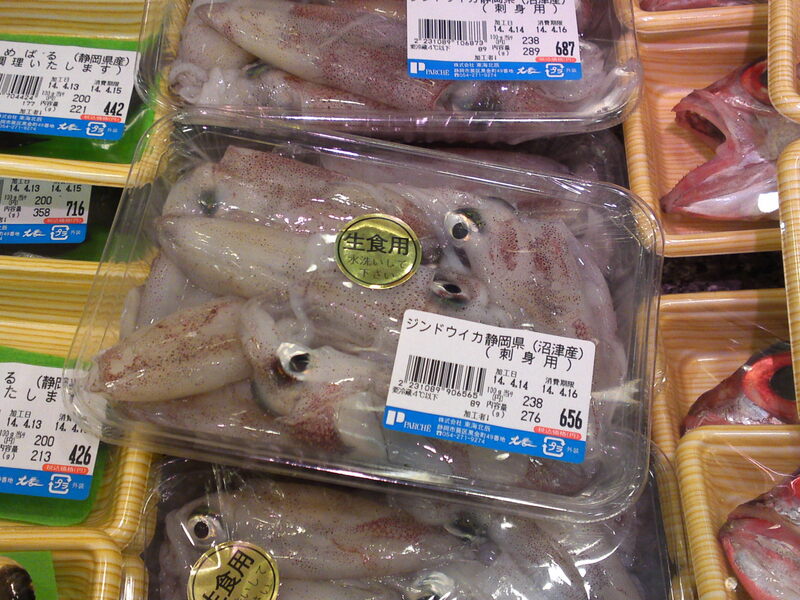 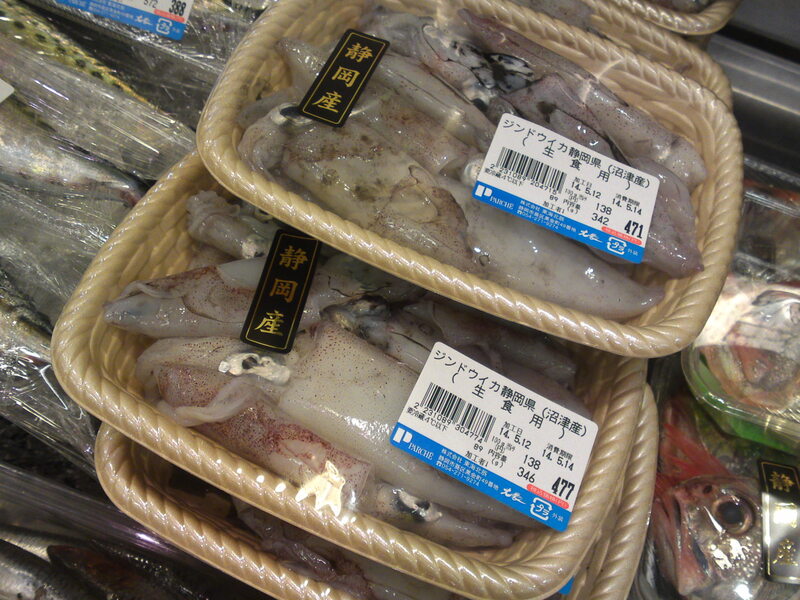 Surume Ika/スルメイカ/Japanese Common Squid, Pacific Flying Squid! 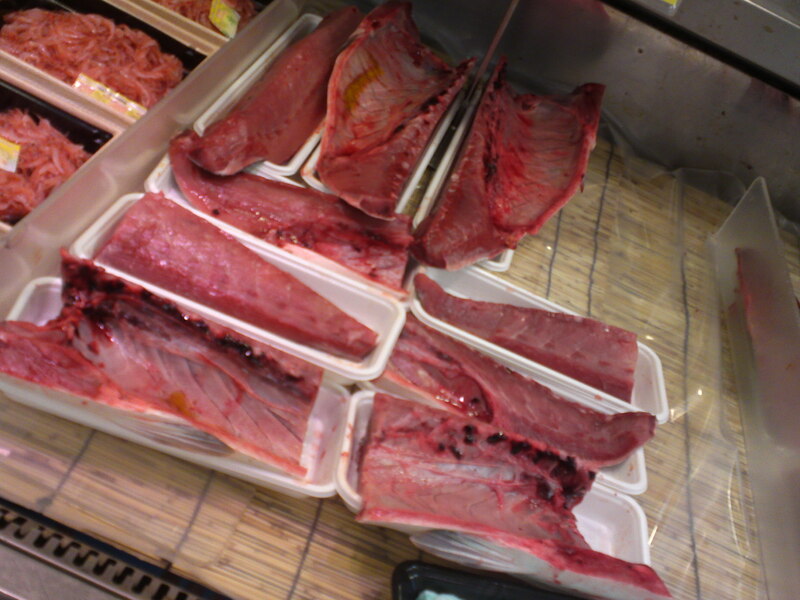 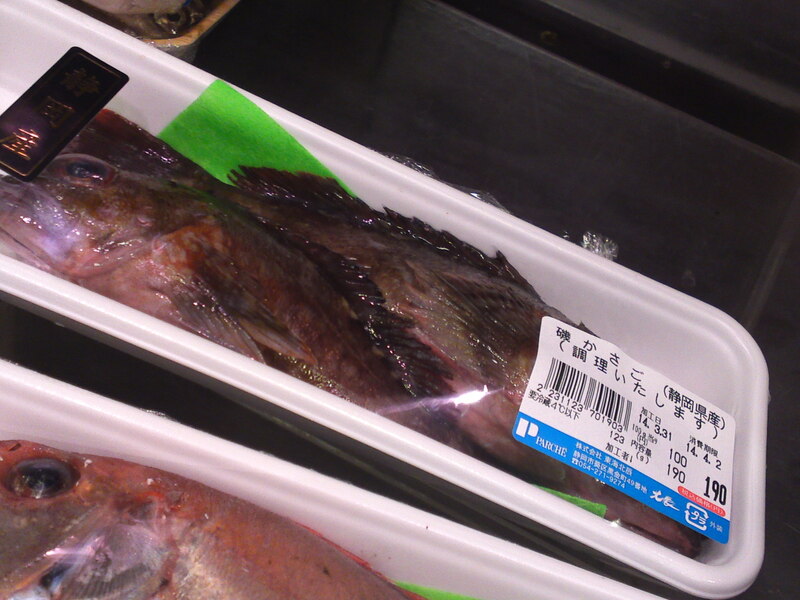 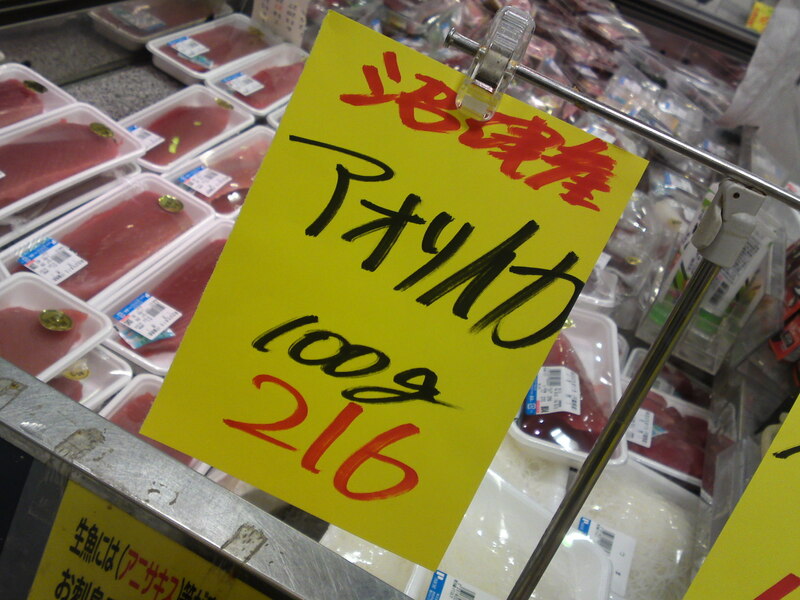 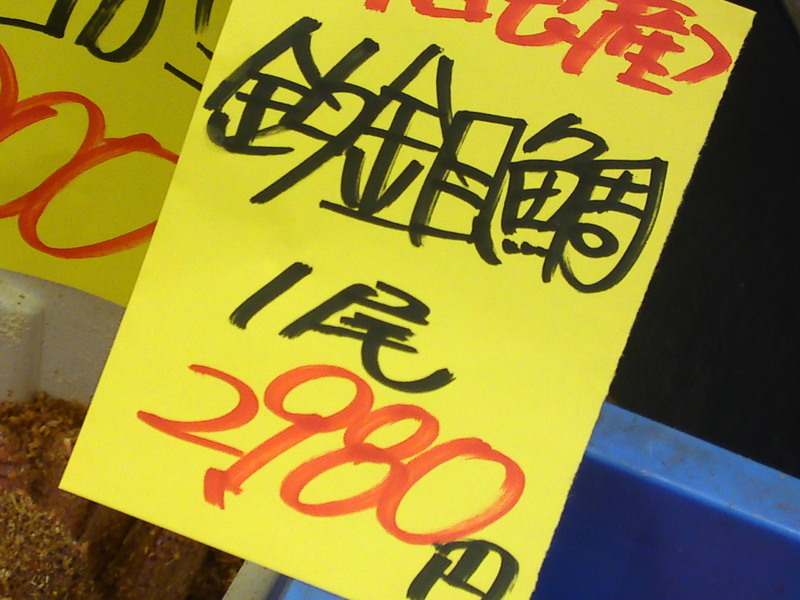 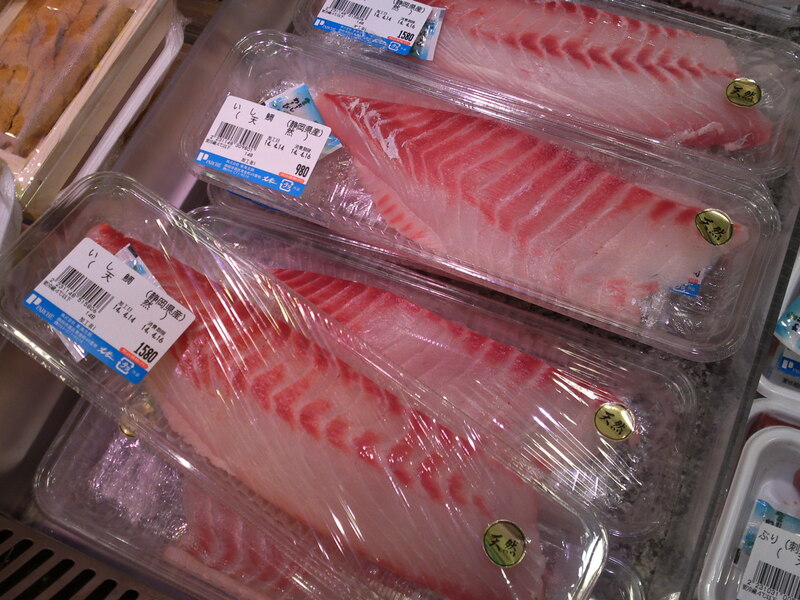 Expensive filets of Ishidai/石鯛, Barred Knifejaw! 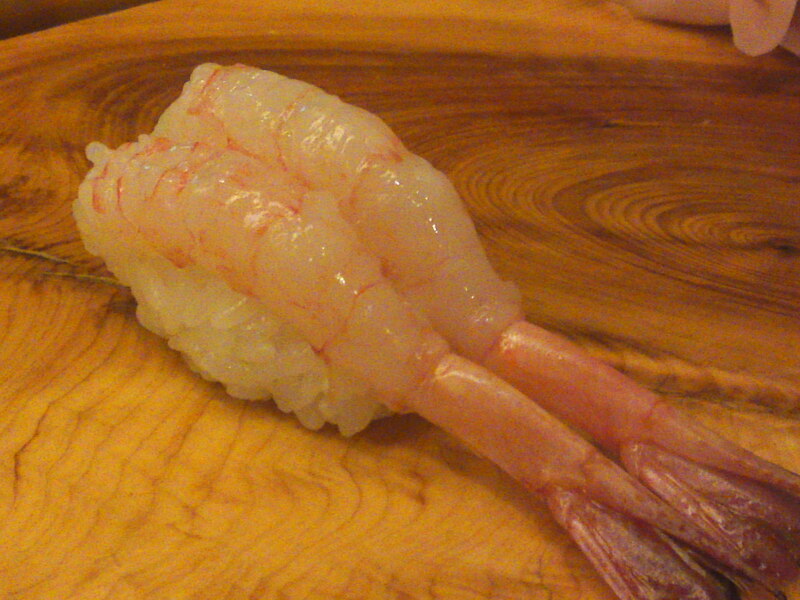 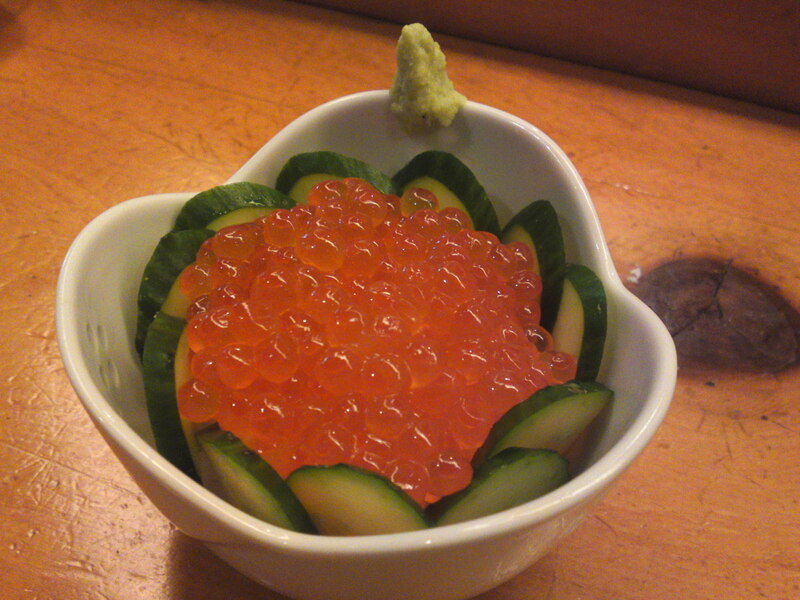 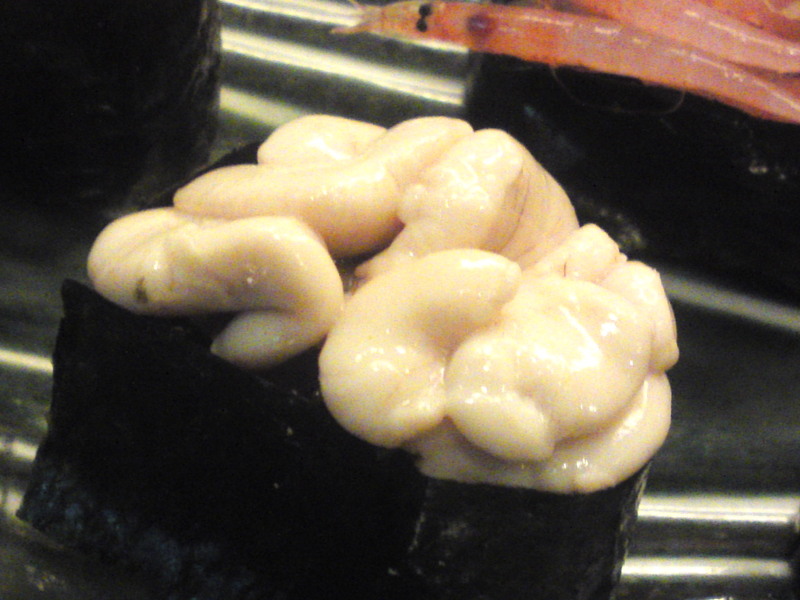 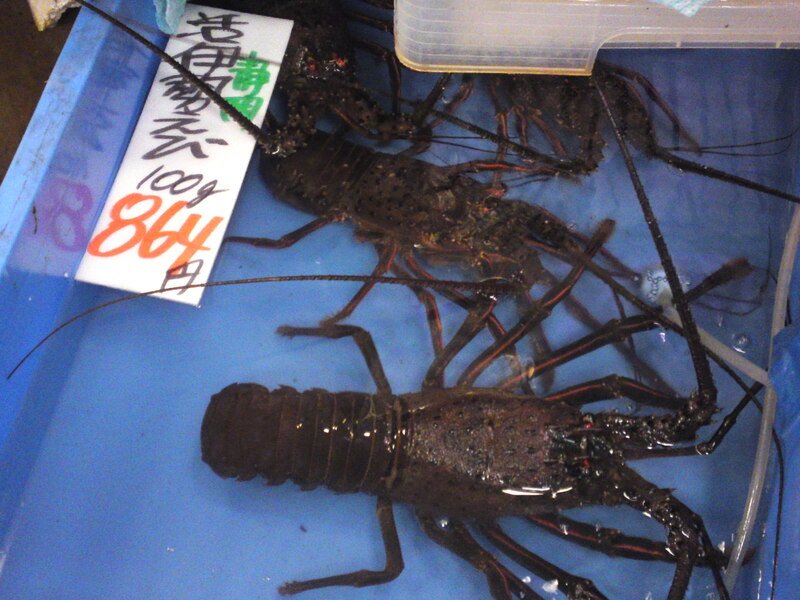 These are usually found in the north of Japan, but we have a smaller variety in Suruga Bay! 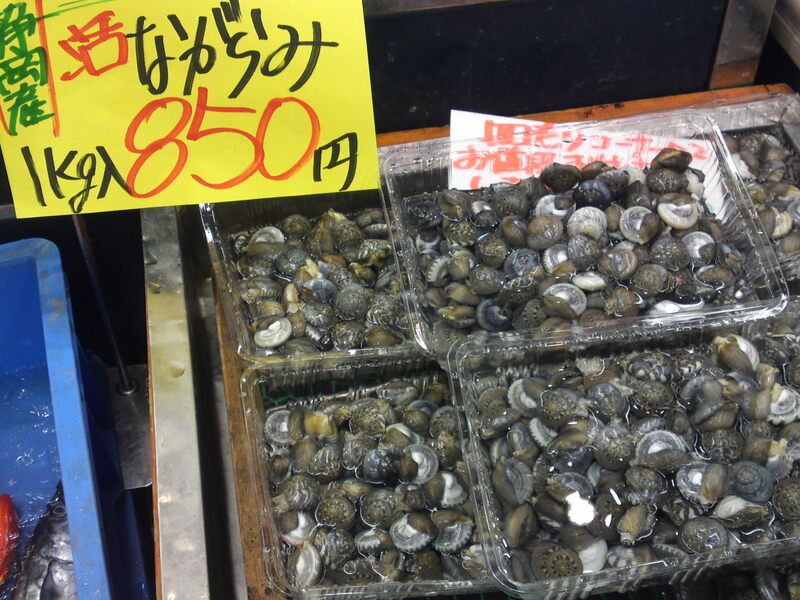 These come from Numazu Harbor! 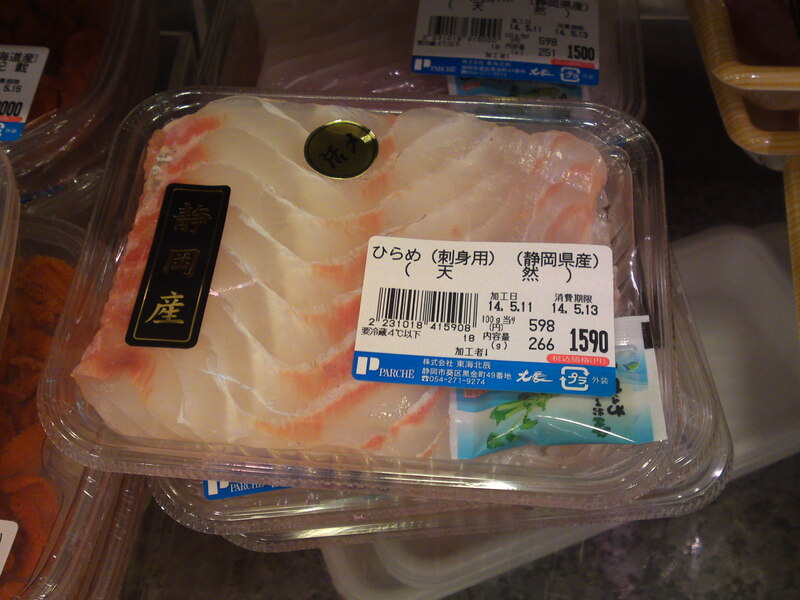 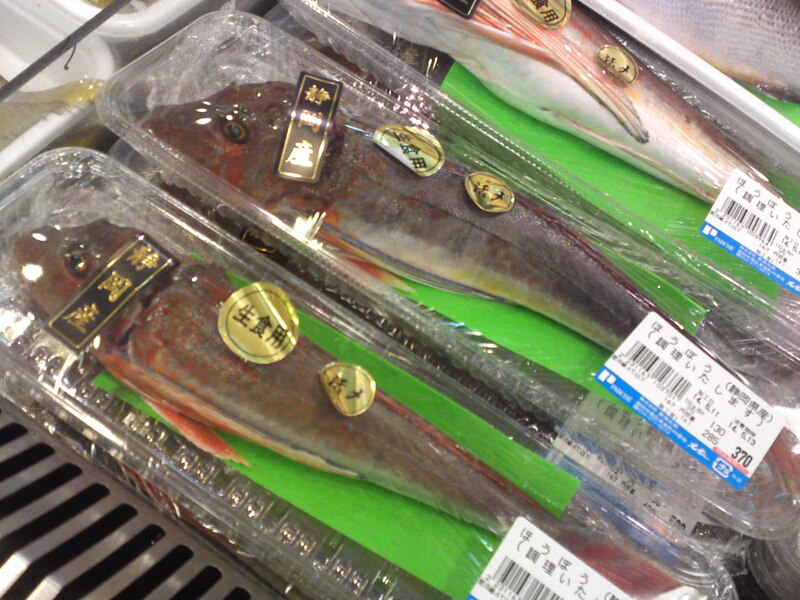 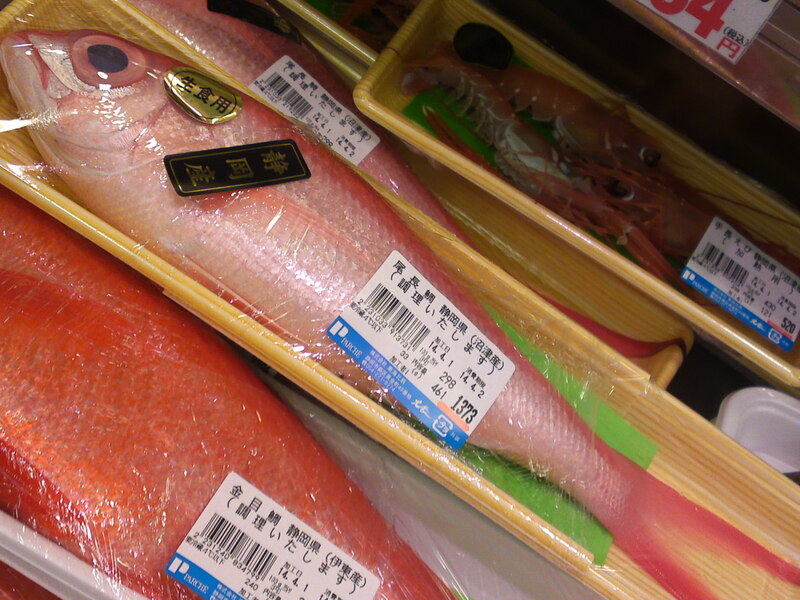 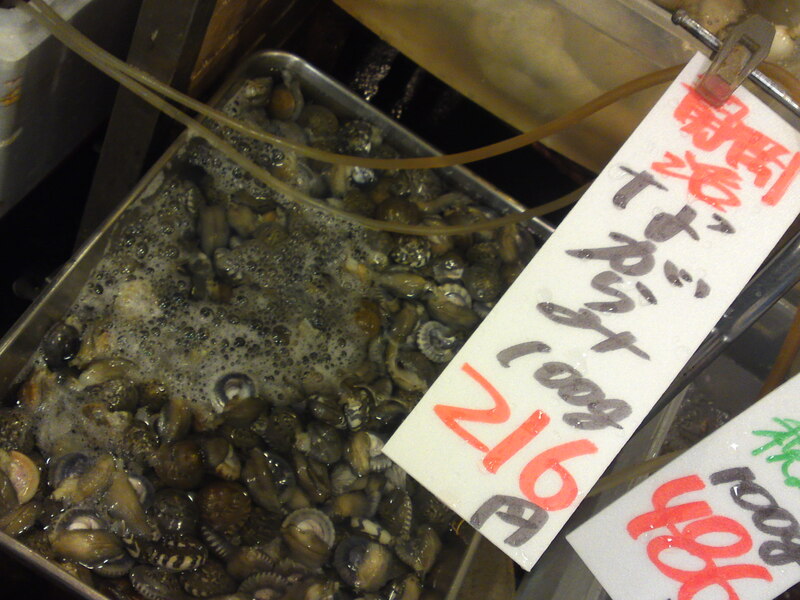 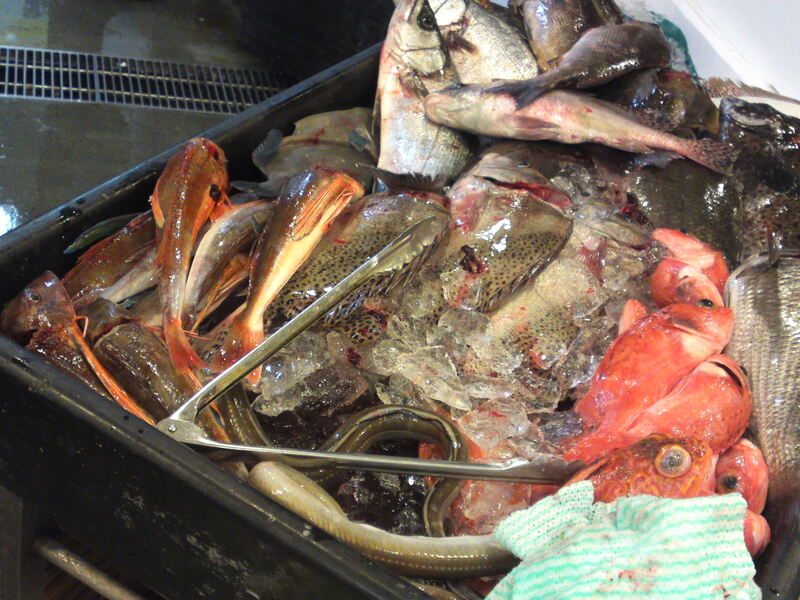 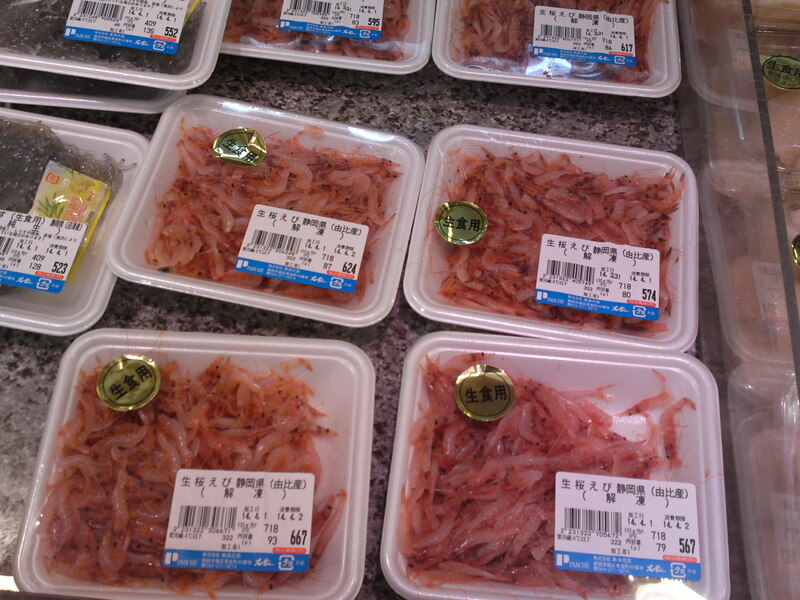 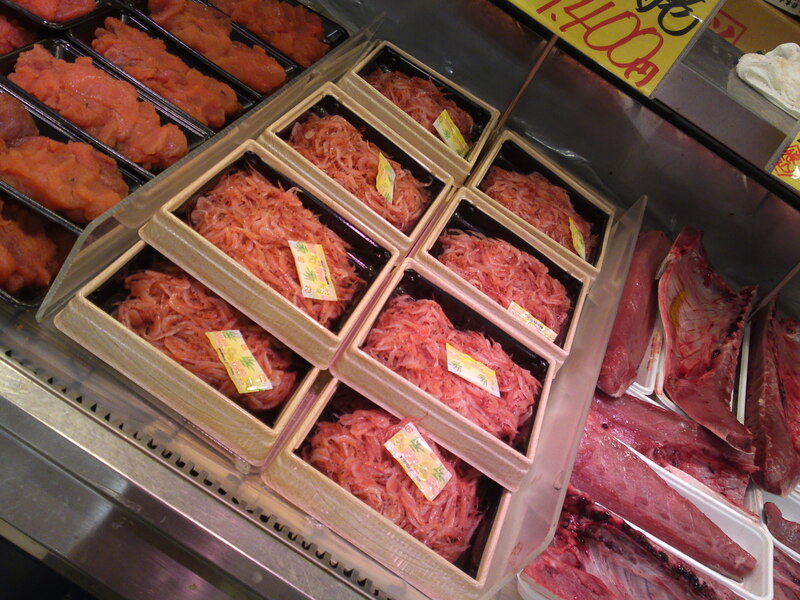 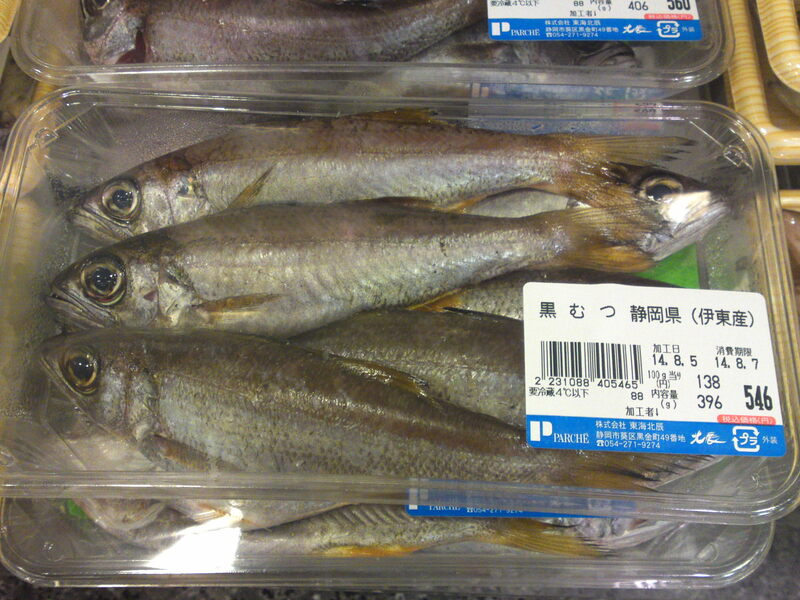 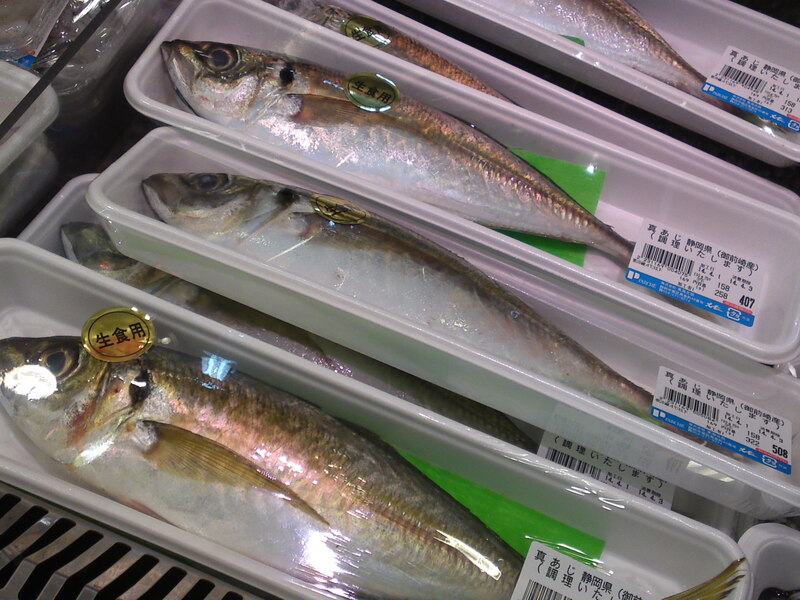 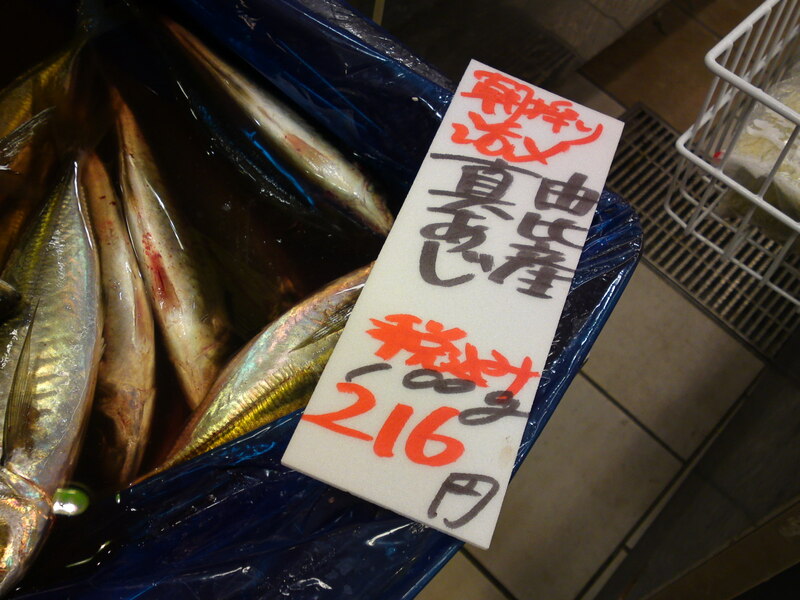 More Seafood & Fish at PARCHE Supermarket in Shizuoka City!-And Sakuraebi & Shirasu! 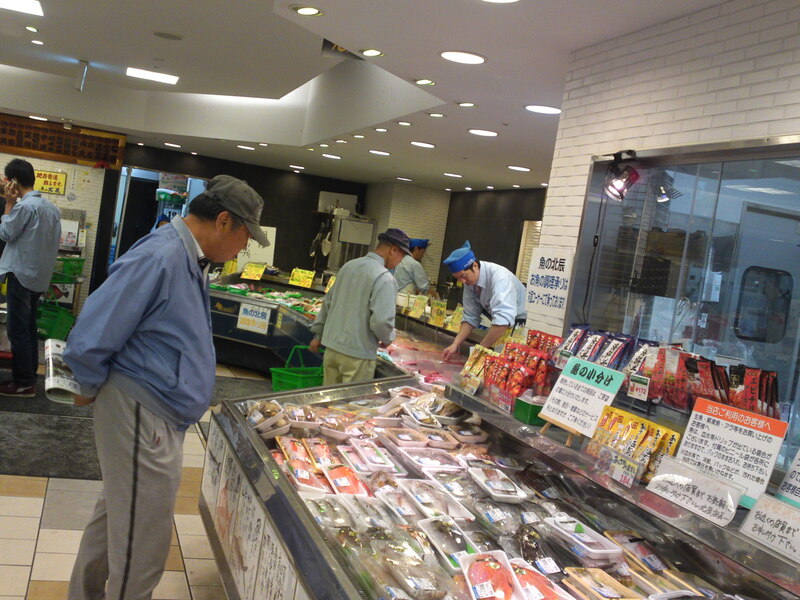 The latest visit to the Shizuoka JR Station Parche supermarket proved I’m right to conduct regular checks on the fish market which is seasonal and where the local seafood arrives directly every morning for the harbors of Numazu, Kogawa, Yui, Omaezaki, Mochimune, Shimoda and many others! 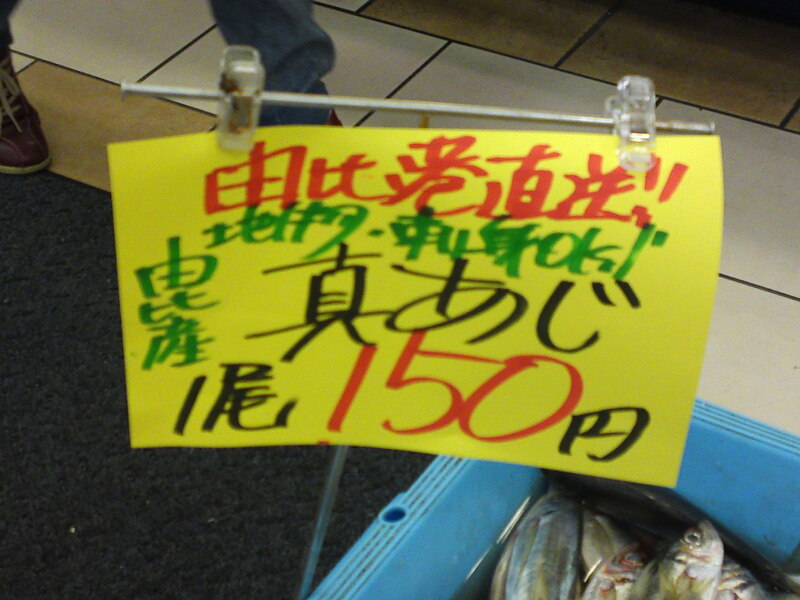 Right, what was of interest that day! 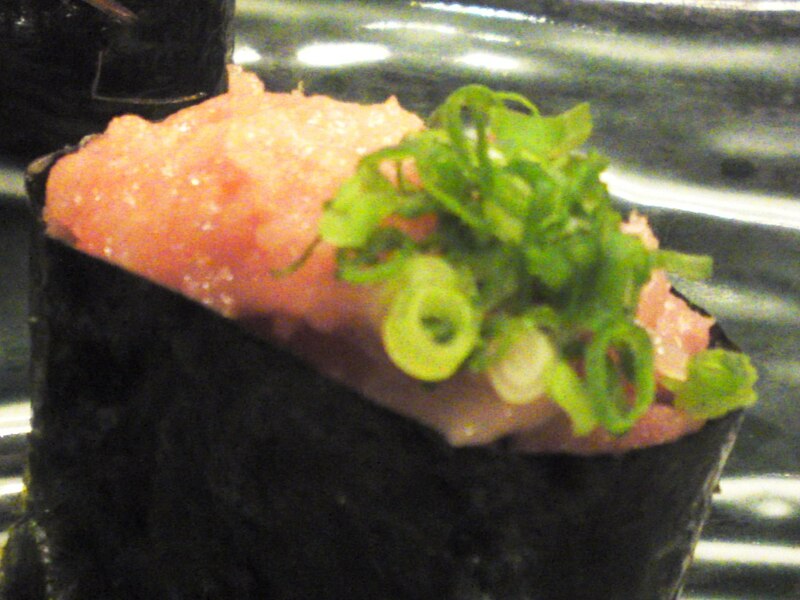 “Tetsubin”, also called “Shimagatsuo”, Brama japonica Hilgendorf! 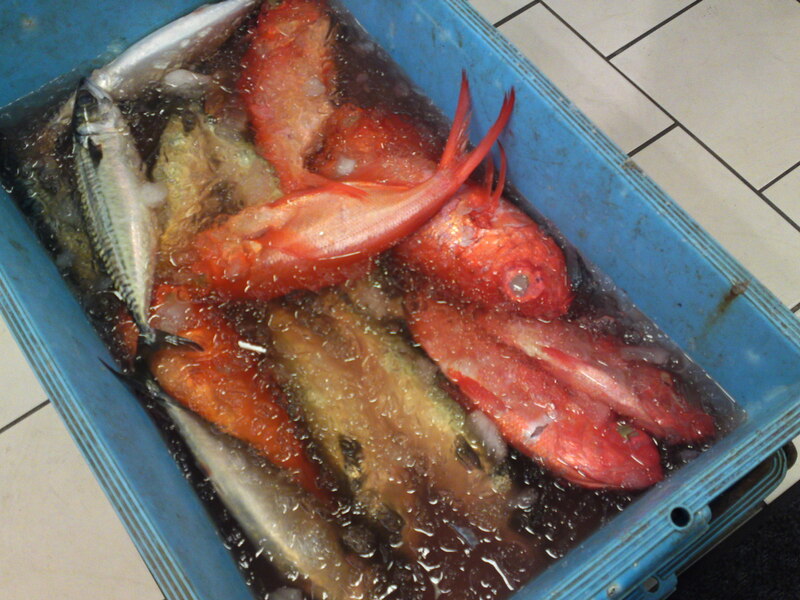 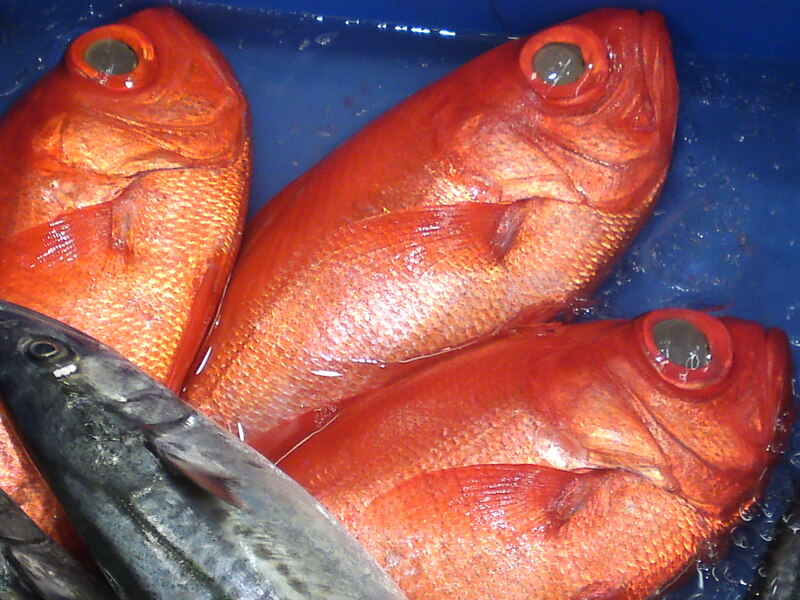 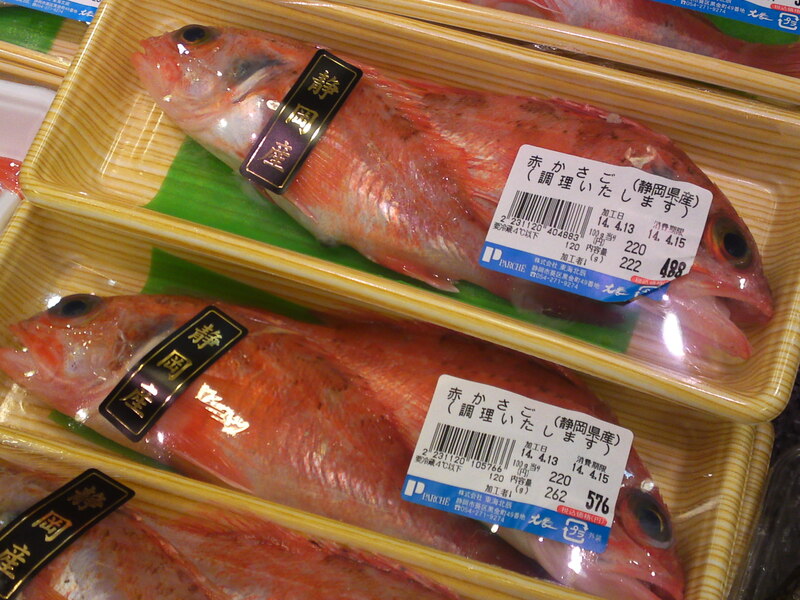 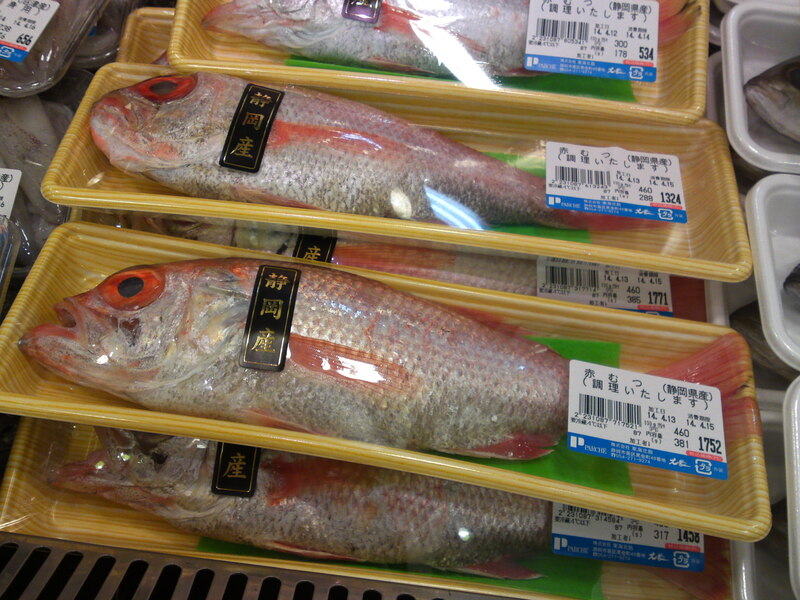 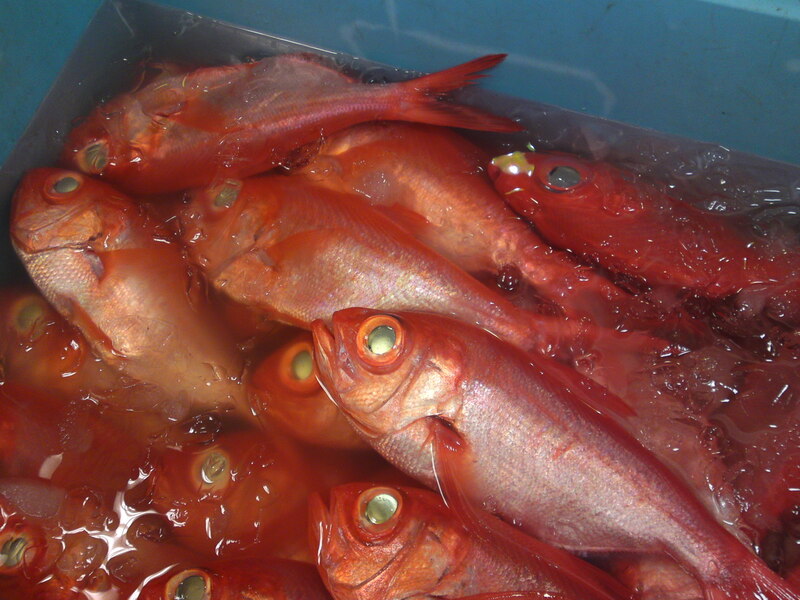 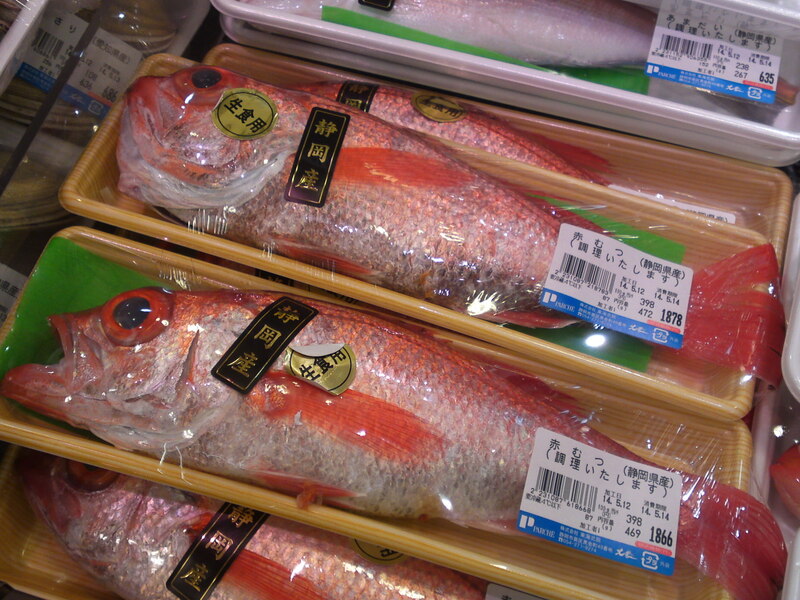 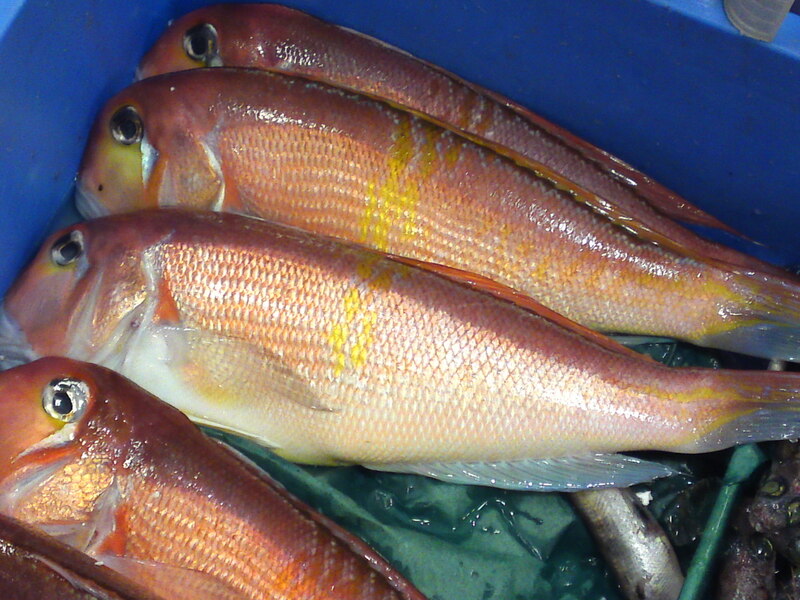 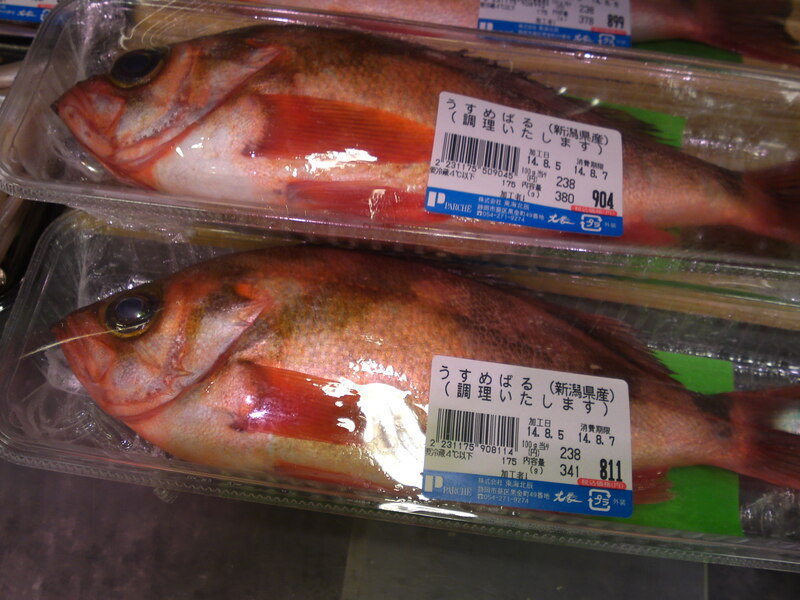 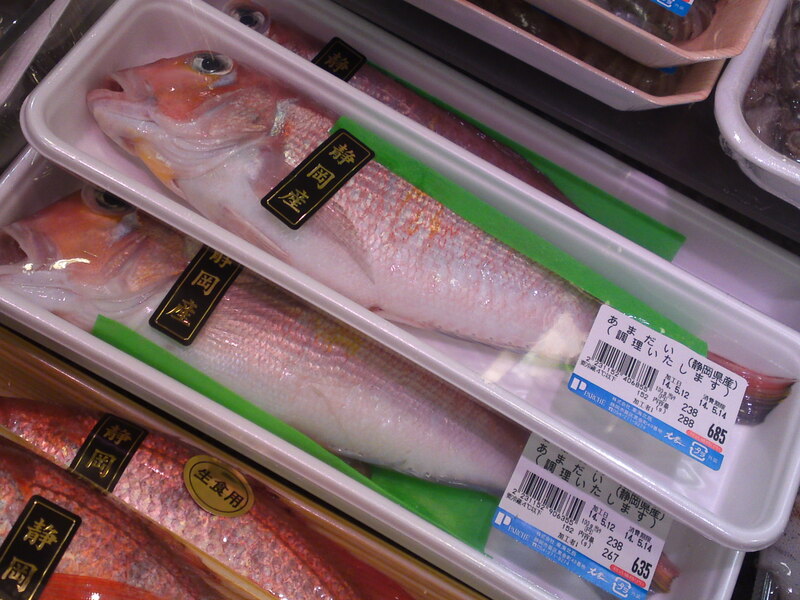 “Onagadai”, also called “hamadai”/Flame snapper/Longtailed red snapper/Onaga! 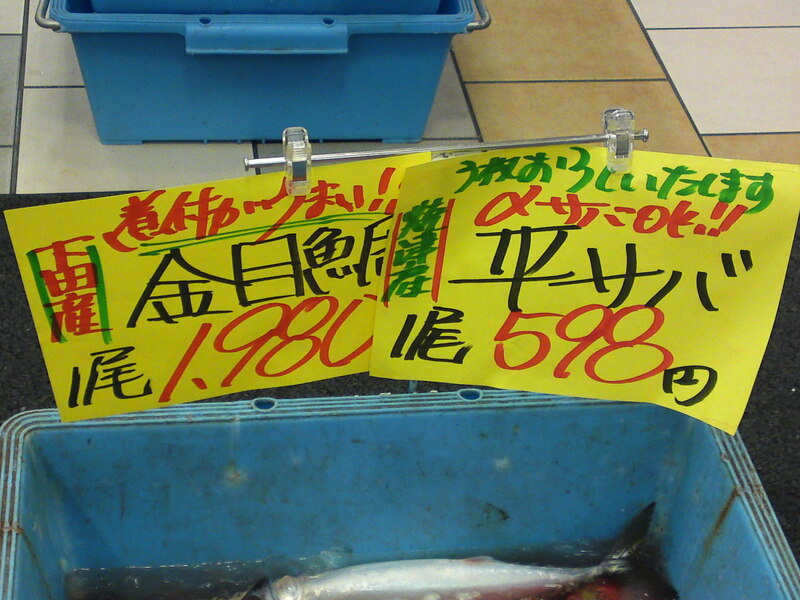 The “Mixed Batch of Shizuoka Fish of the DAY”! 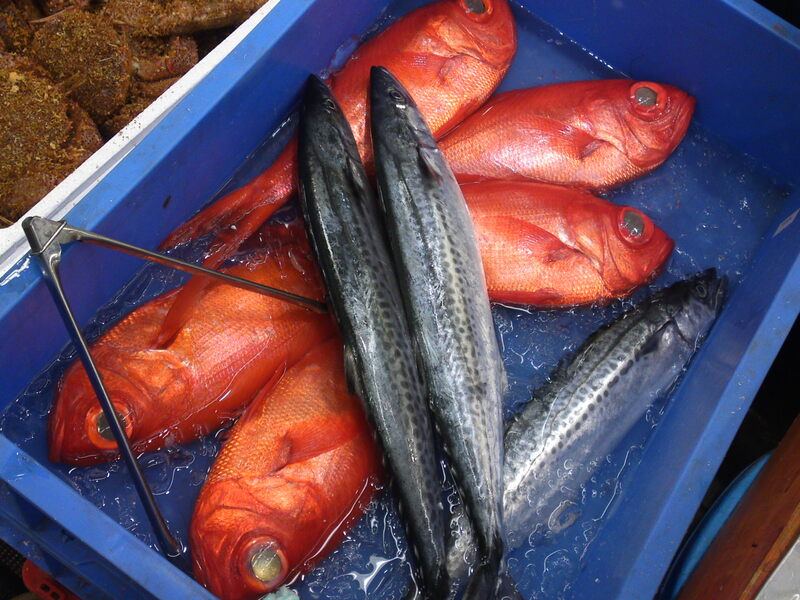 Hirame/sole, Onikasago/Devil (red) marbled Rockish, Hira Suzuki/A local seabass variety, Kinmedai/Splendid Alfonsino, Inada/Young Japanese Amberjack, Anago/Conger eel (From Chiba Prefecture! 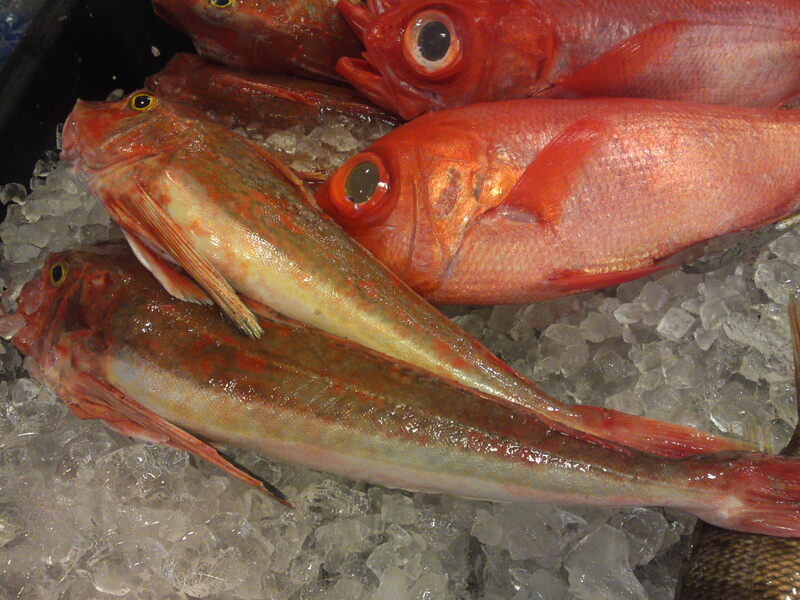 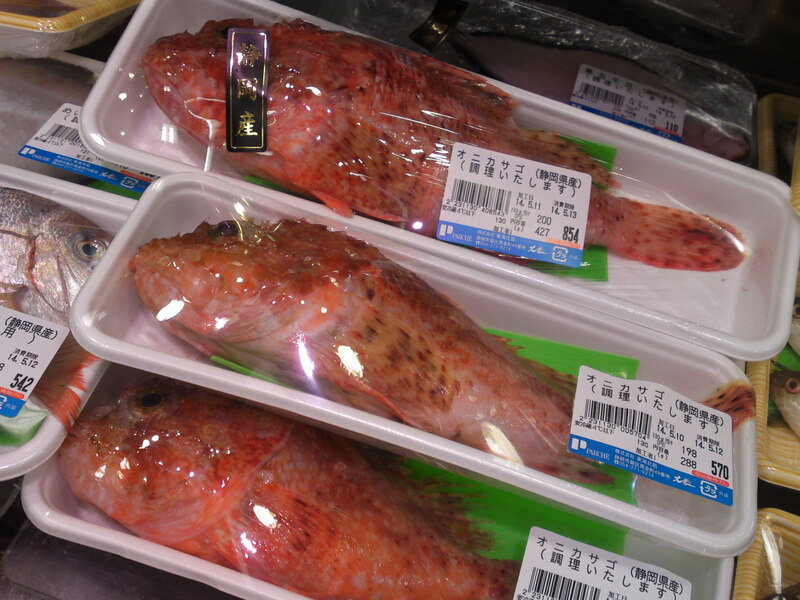 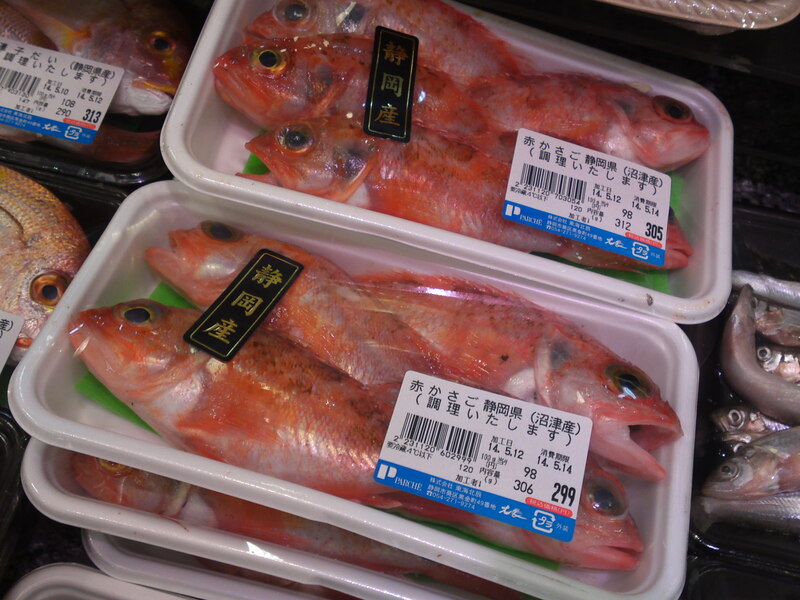 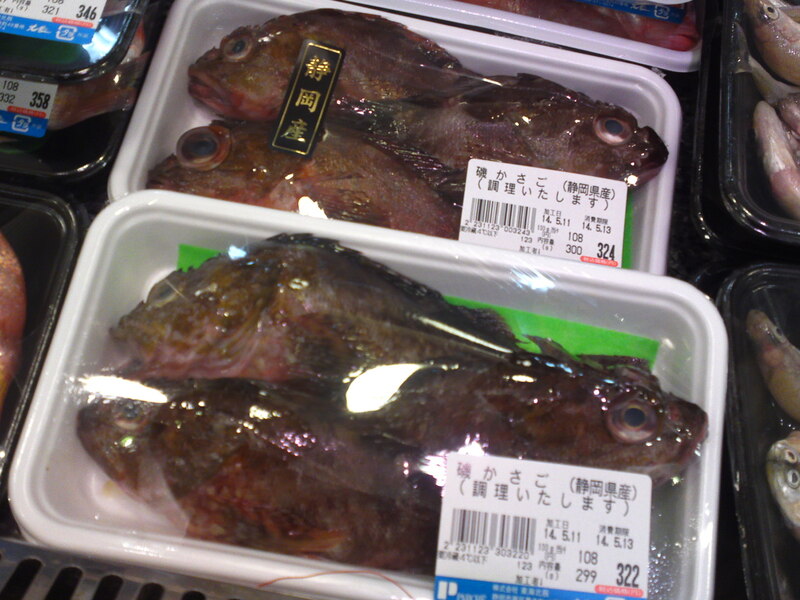 ), KurodaiJapanese black porgy, Kawahagi/Filefish, Houbou/Red Gurnard! 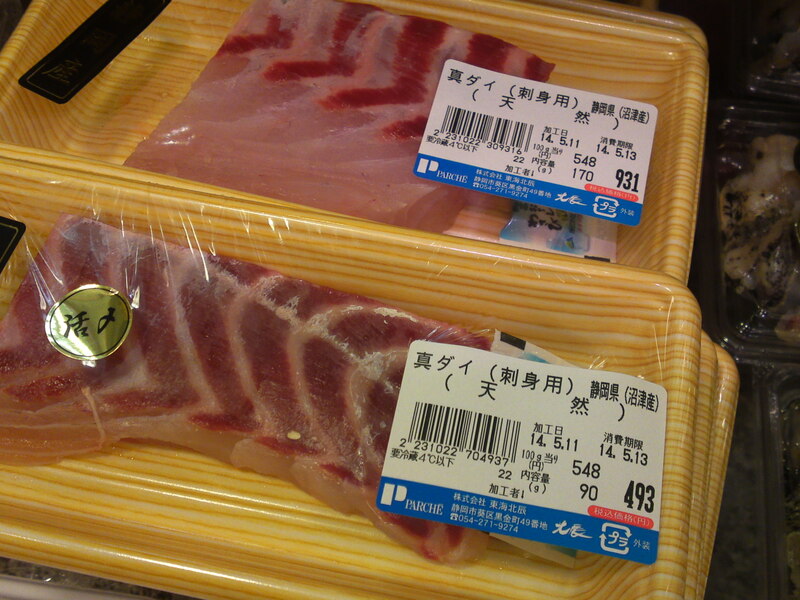 Amadai/Tilefish for high class grill! 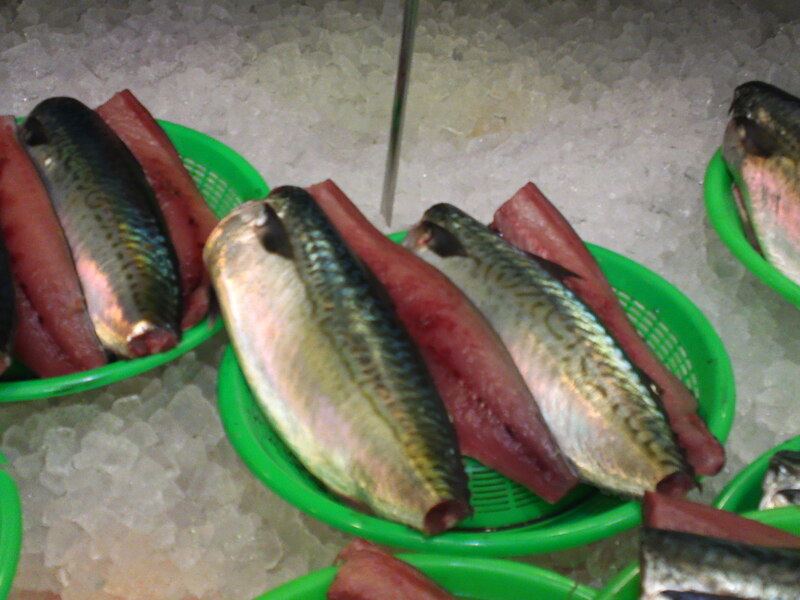 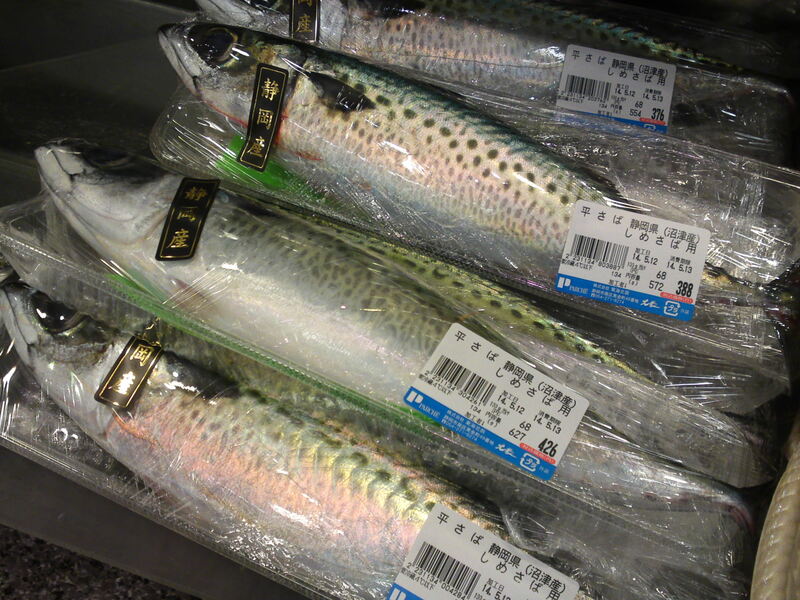 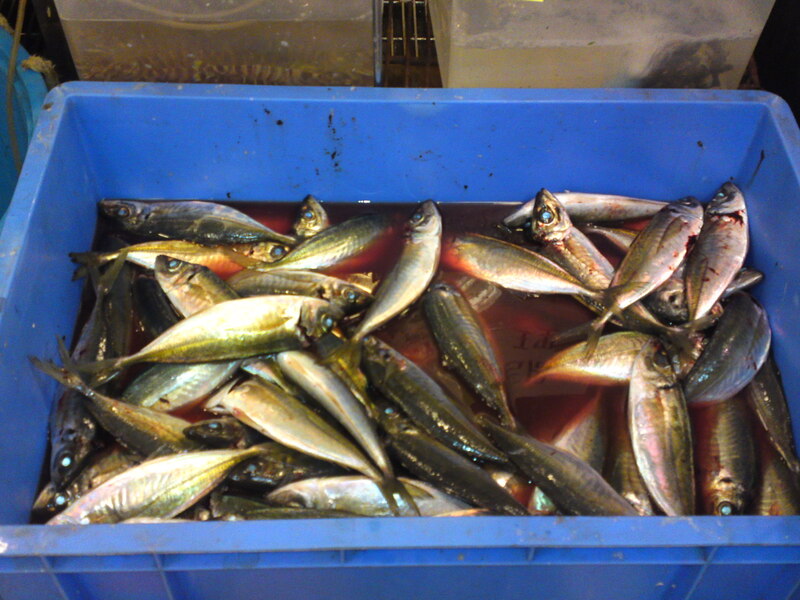 Hira saba, a very large variety of Mackerel! 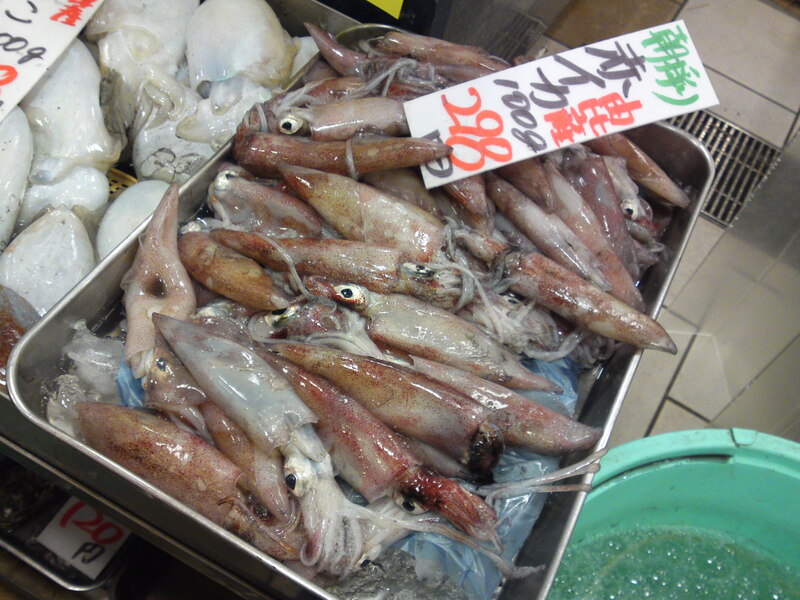 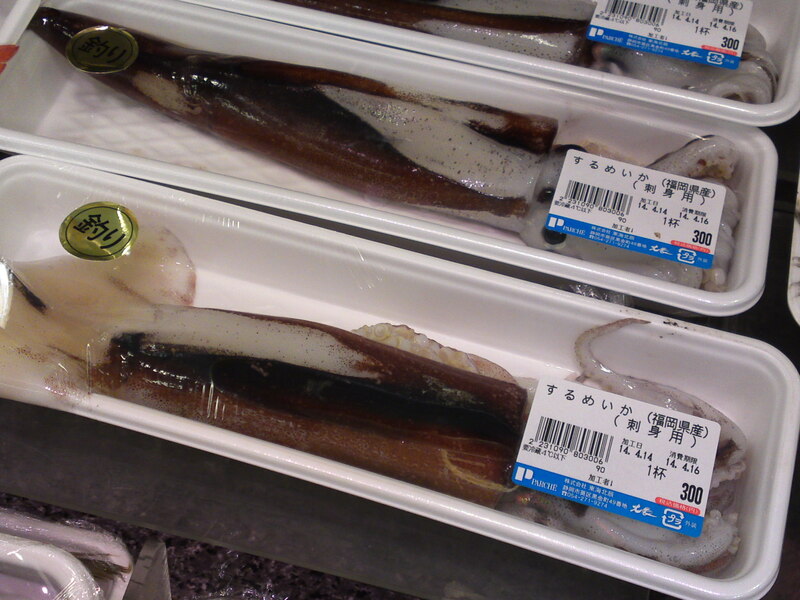 Very large Surume Ika/Japanese Flying Squid! 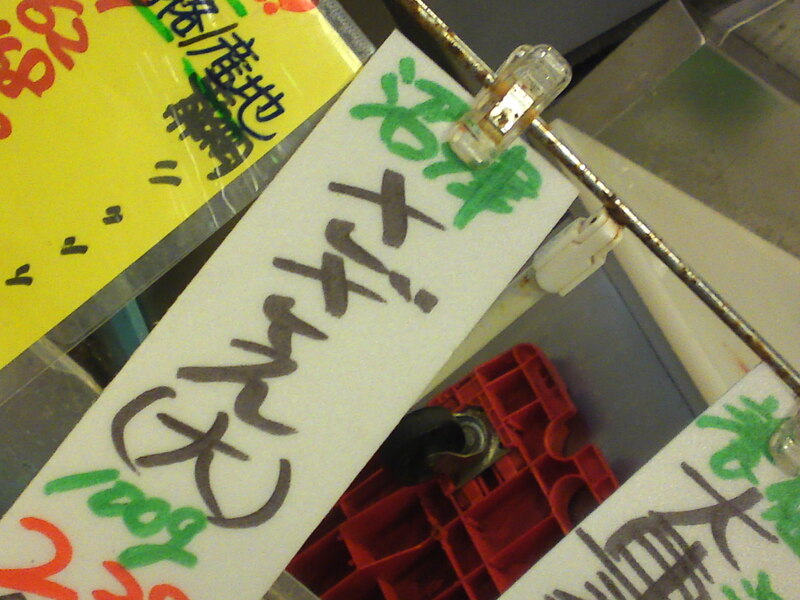 From all over Shizuoka Prefecture! 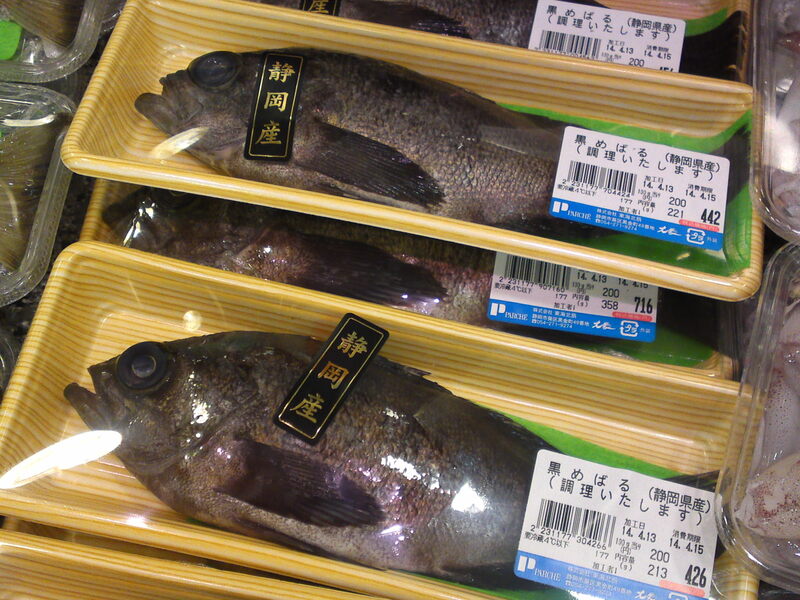 Isokasago/Another variety of Rock fish! 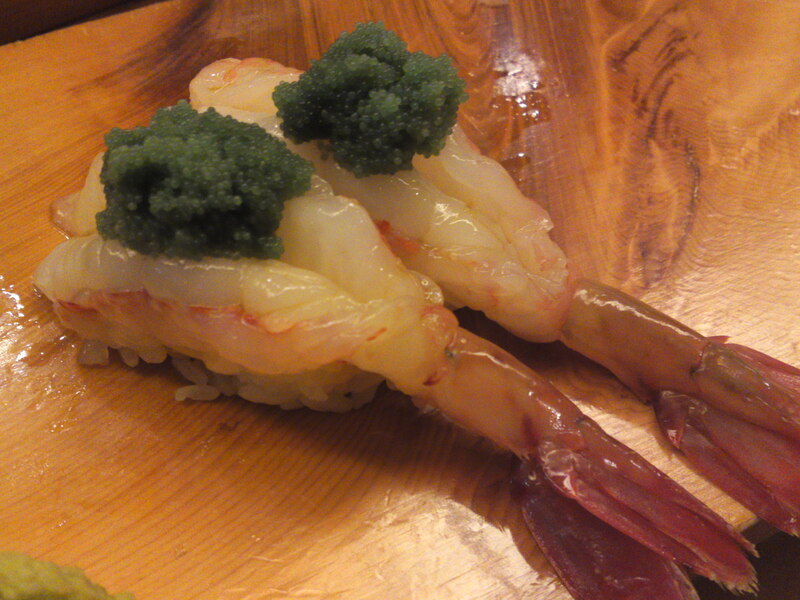 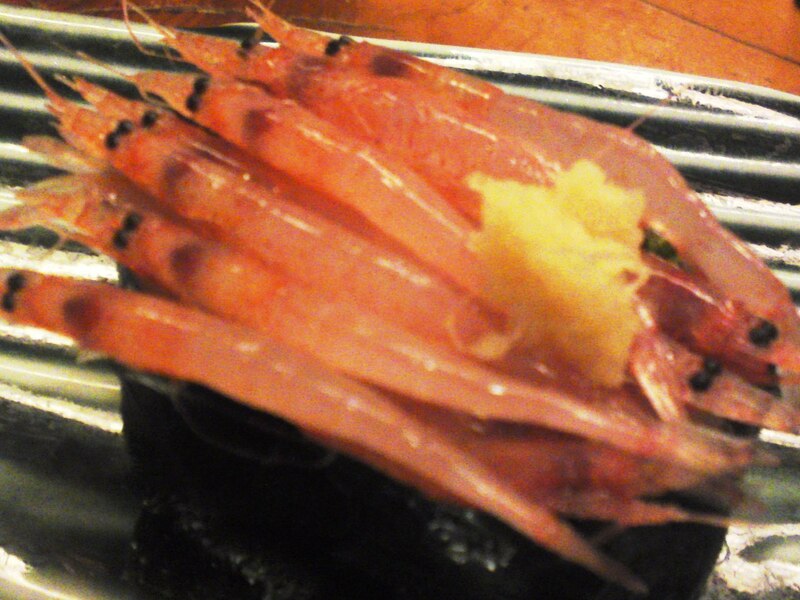 Sakura ebi/Cherry shrimps from Yui! 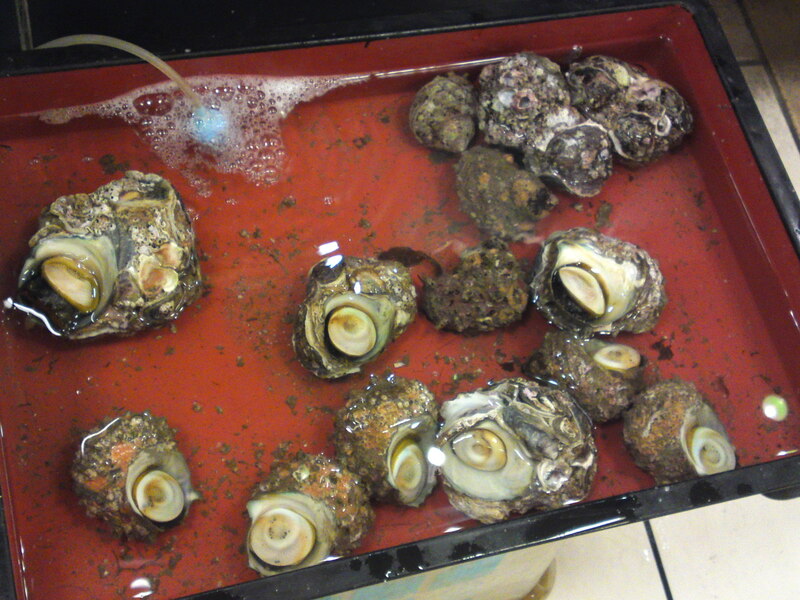 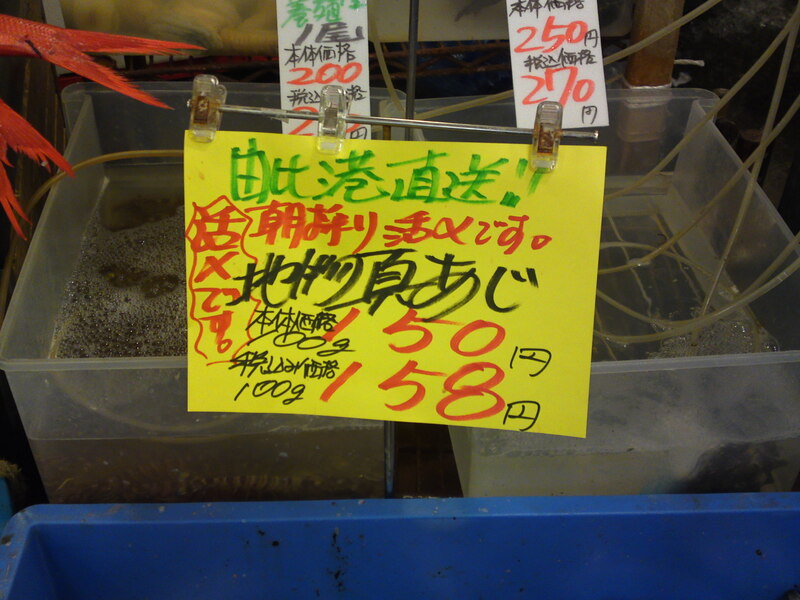 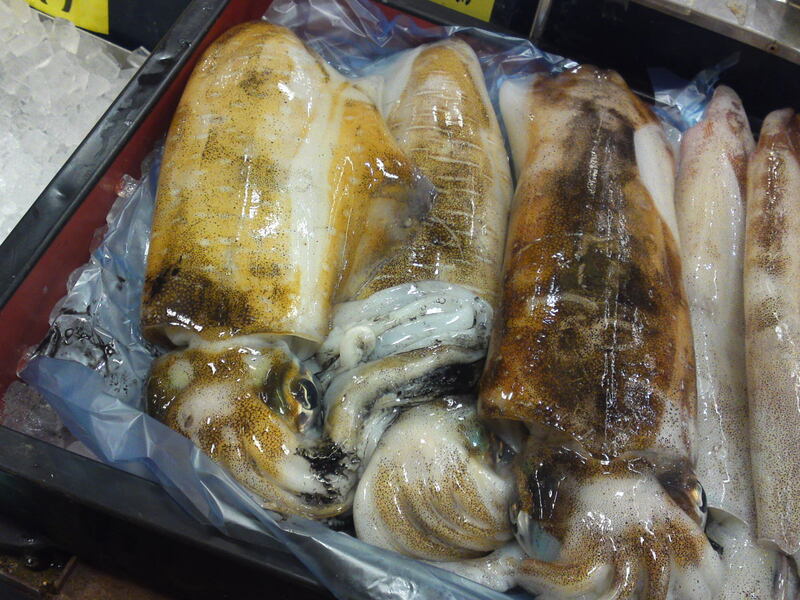 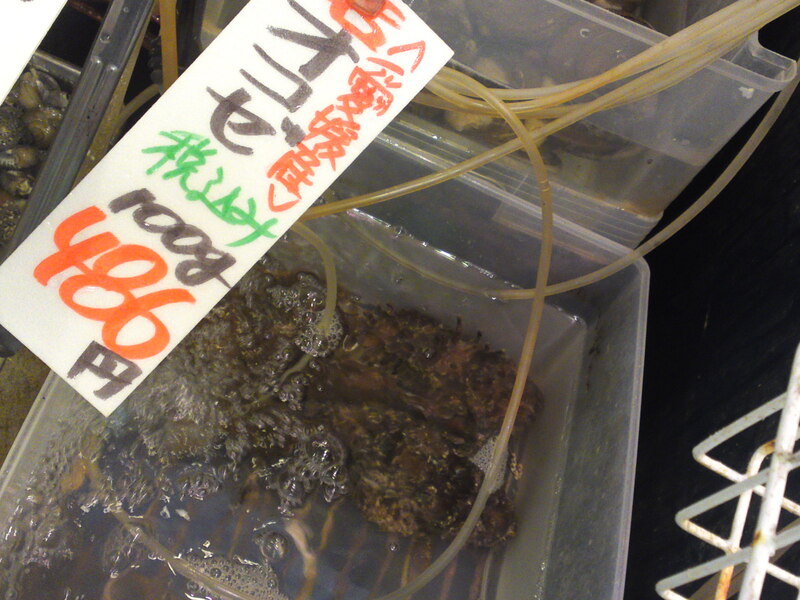 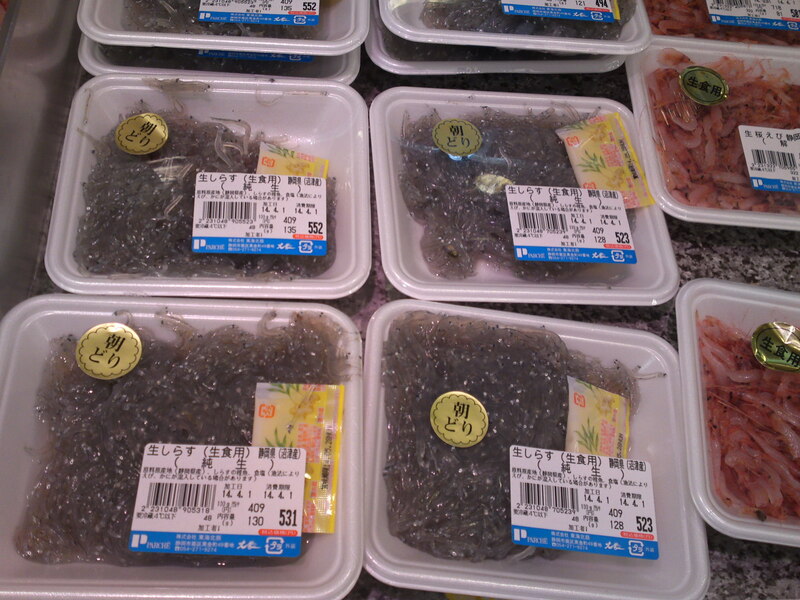 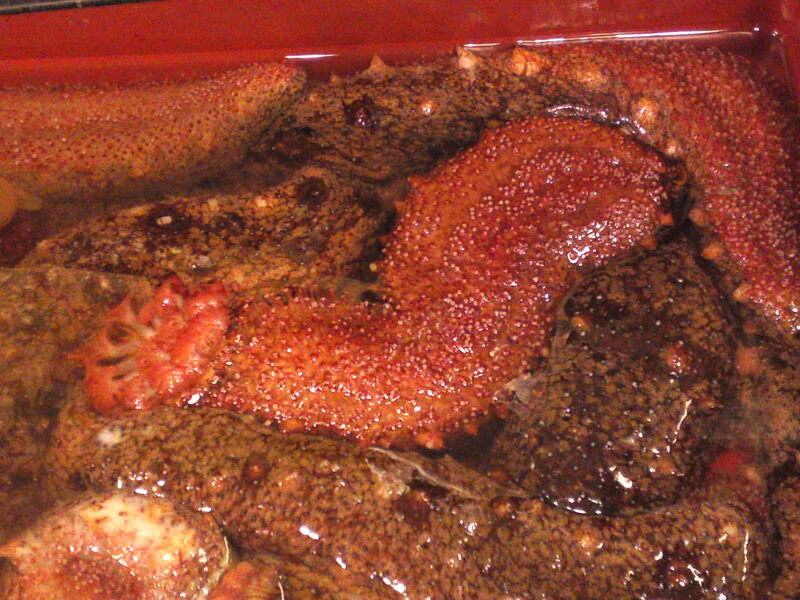 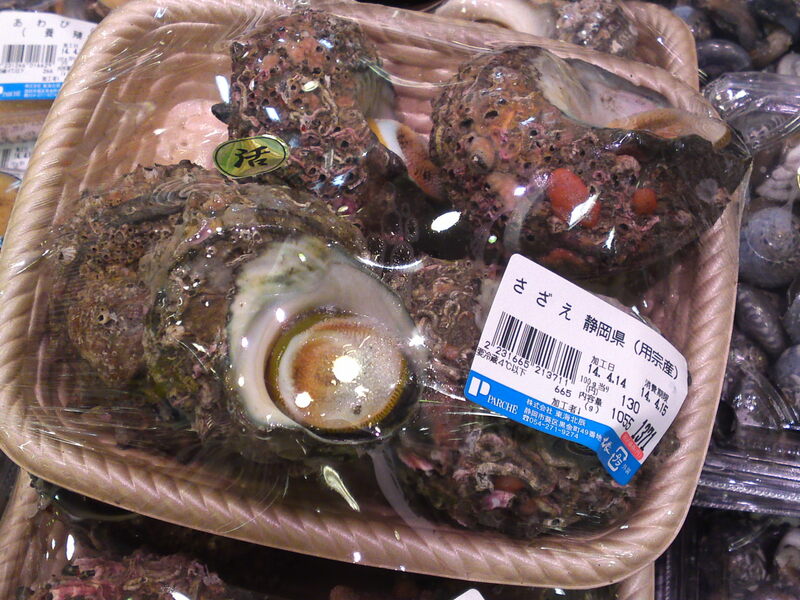 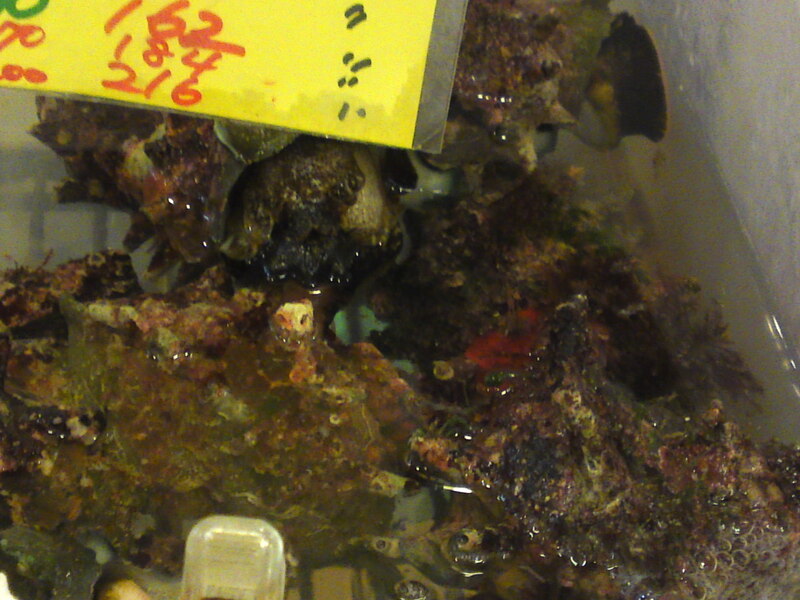 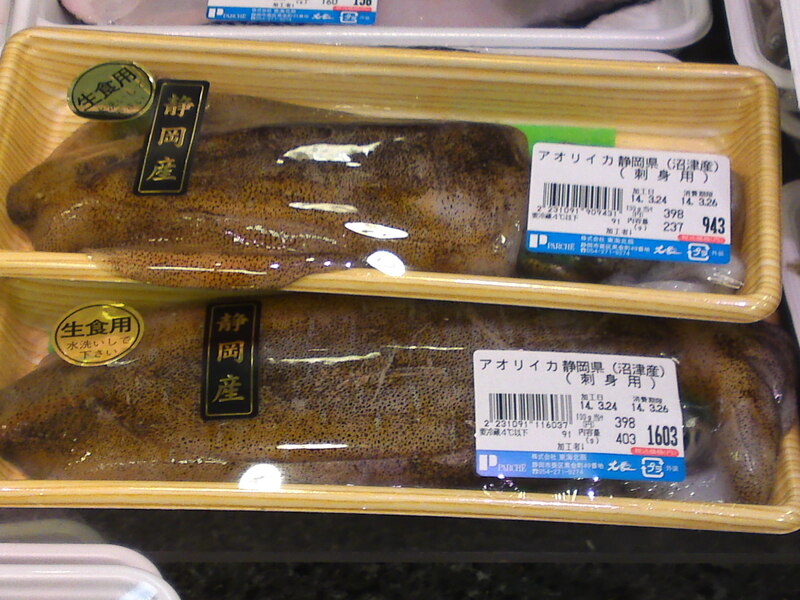 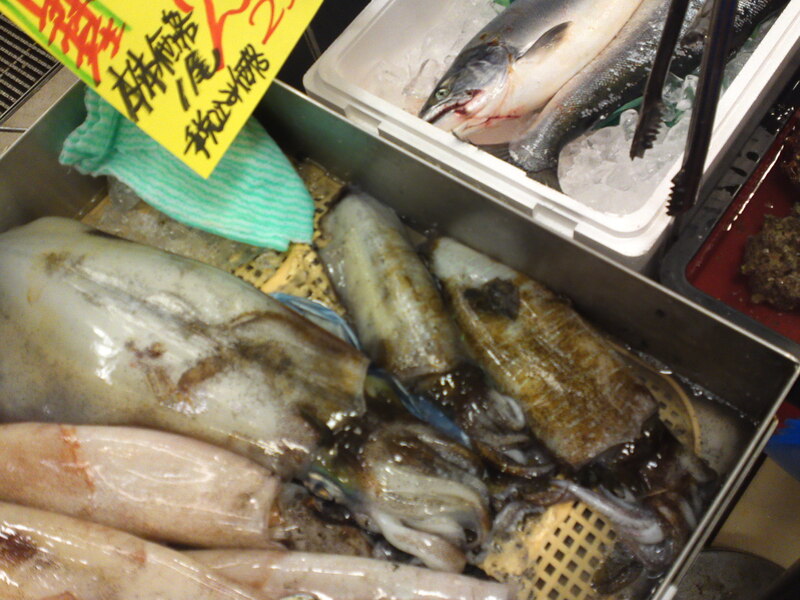 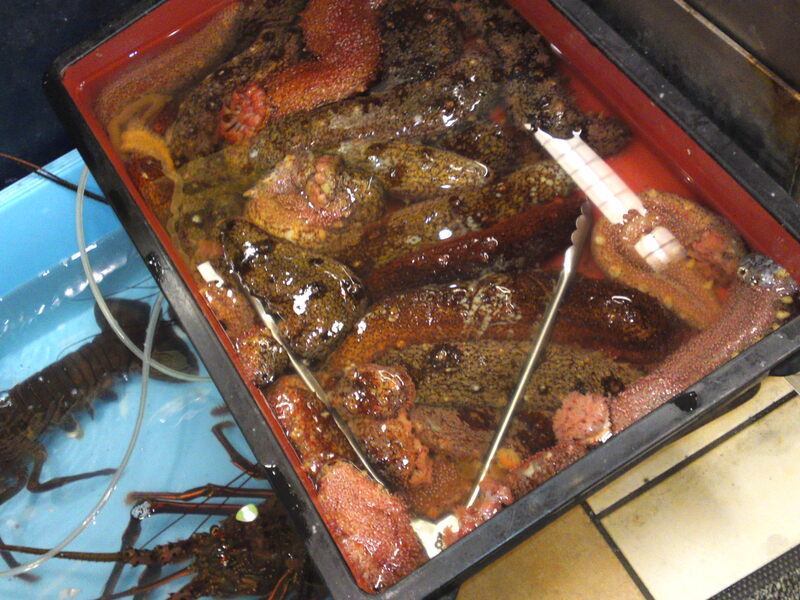 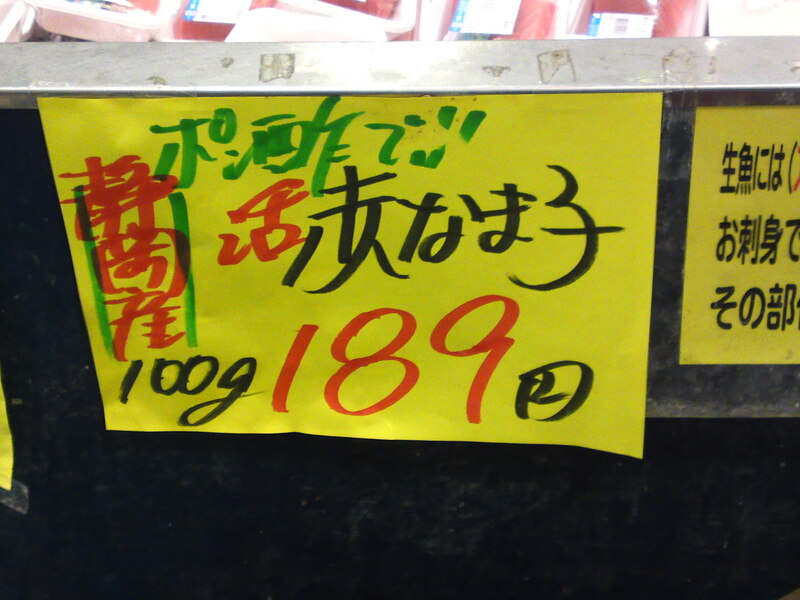 More Seafood & Fish at PARCHE Supermarket in Shizuoka City!-And Sea Slug! 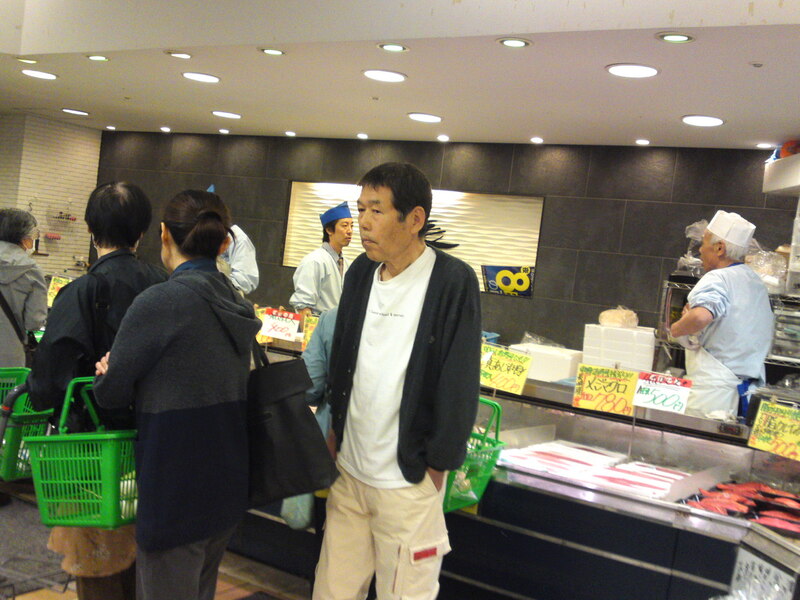 I’m just repeating myself, not now but always it is time to have a good look (and buy) seafood and fish at the big supermarket in Parche, Shizuoka JR Station, in Shizuoka City, especially local! 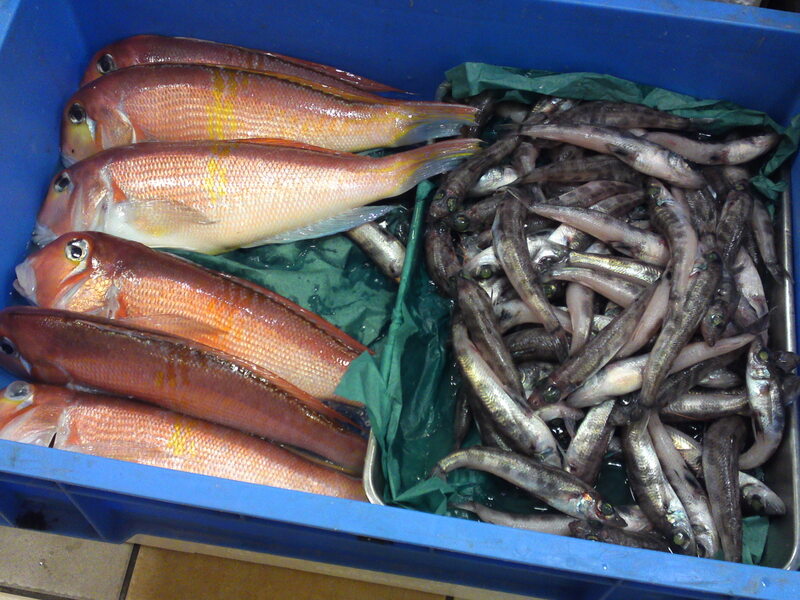 And once again I had a good look yesterday as Mondays are especially busy! 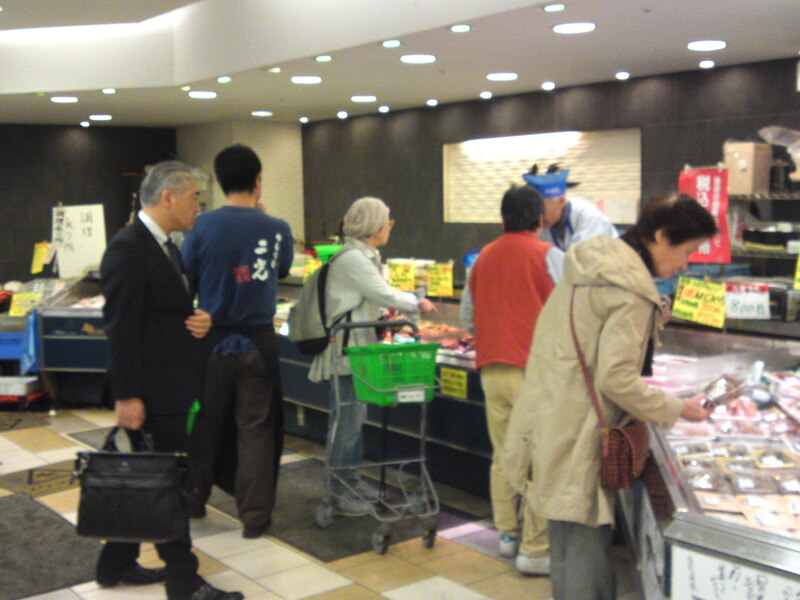 I don’t know how I managed to take that picture in spite of the crowd! 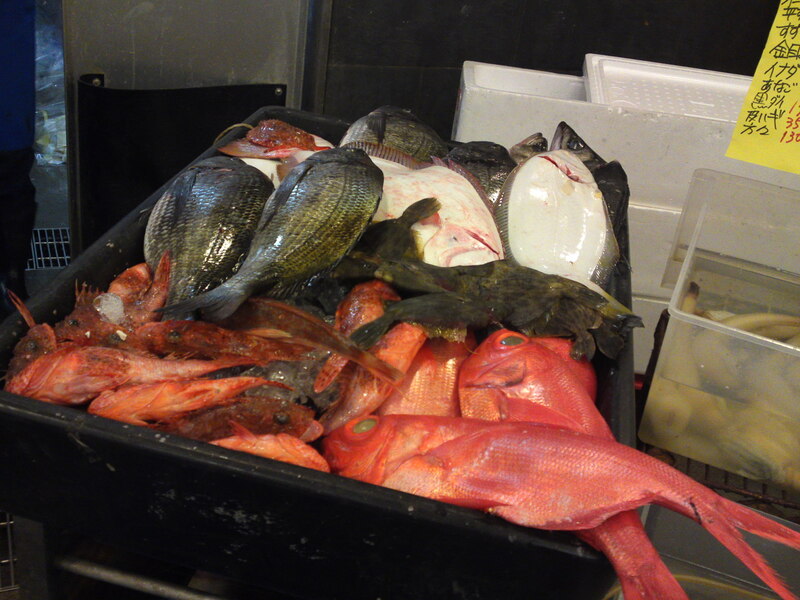 The mixed batch as usual! 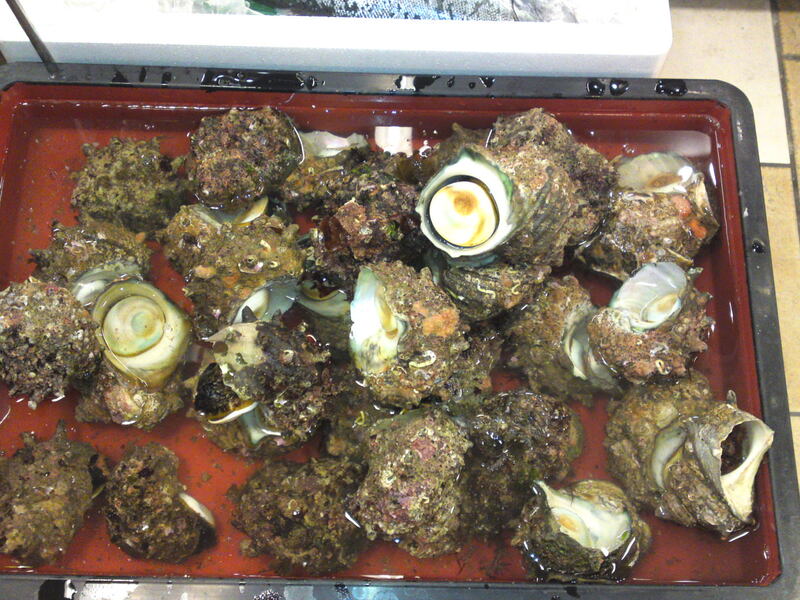 All coming from the Suruga Bay, they will suddenly disappear when the izkaya cooks come early in the afternoon! 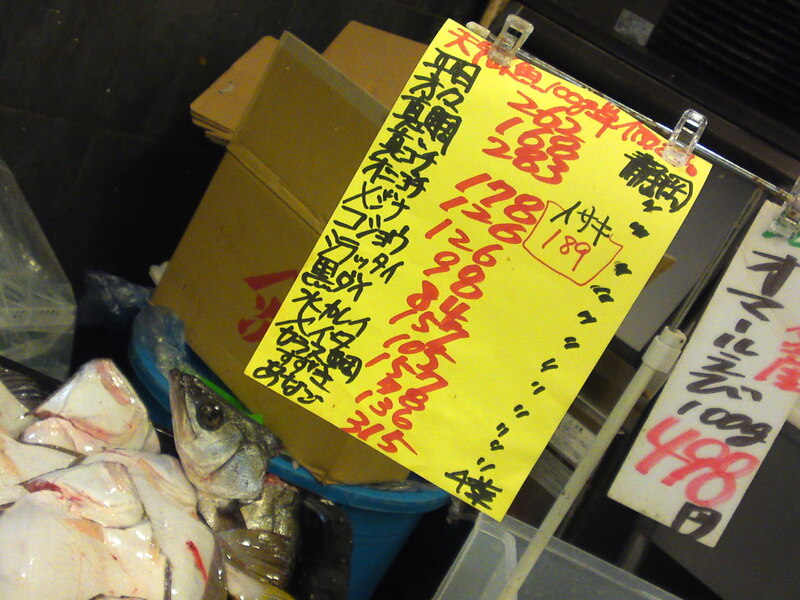 Sole, Red robin, True seabream, True sand borer, Devil sand borer, Largescale blackfish, Kosyou (no English name! 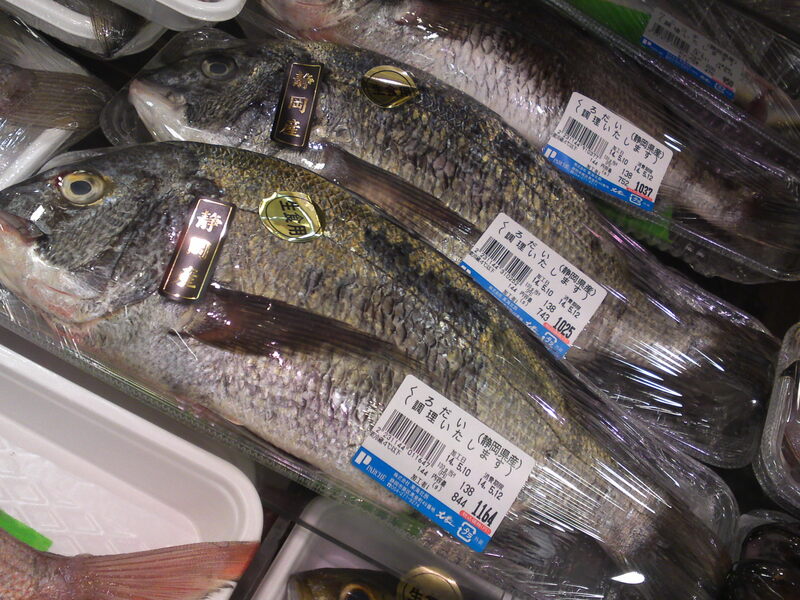 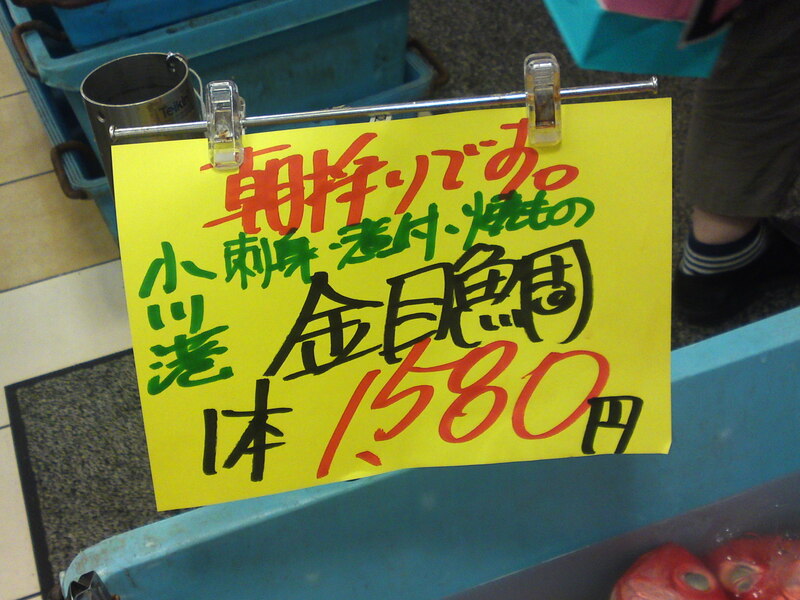 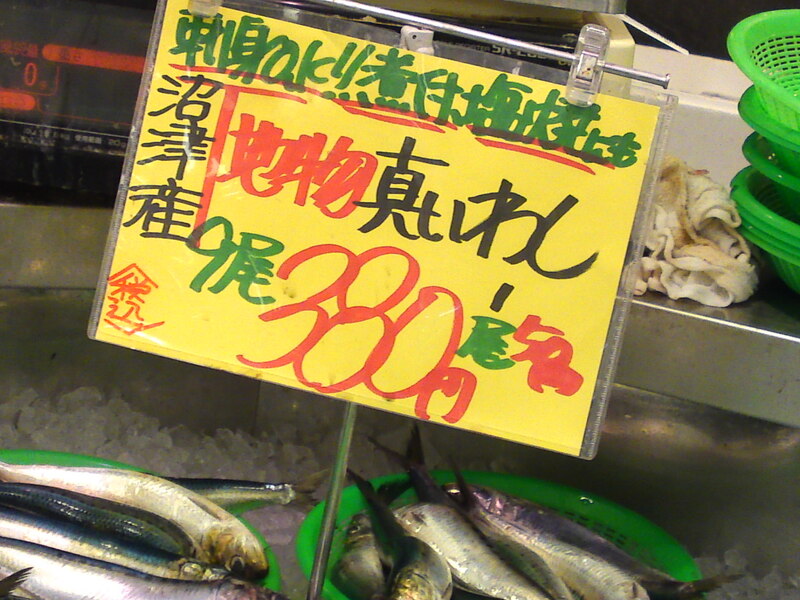 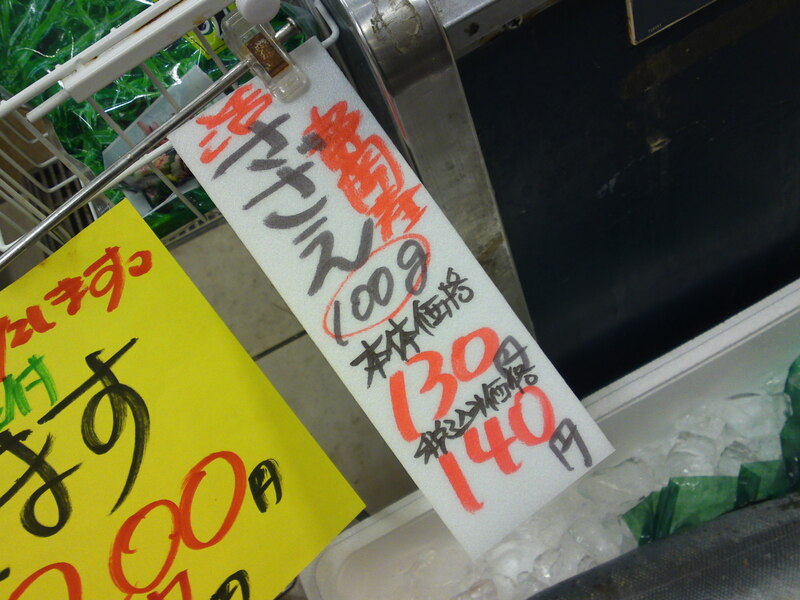 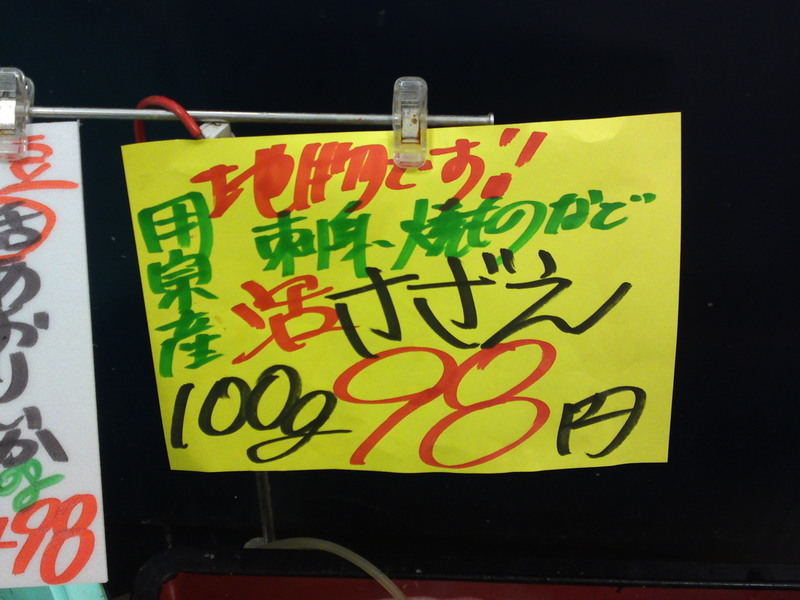 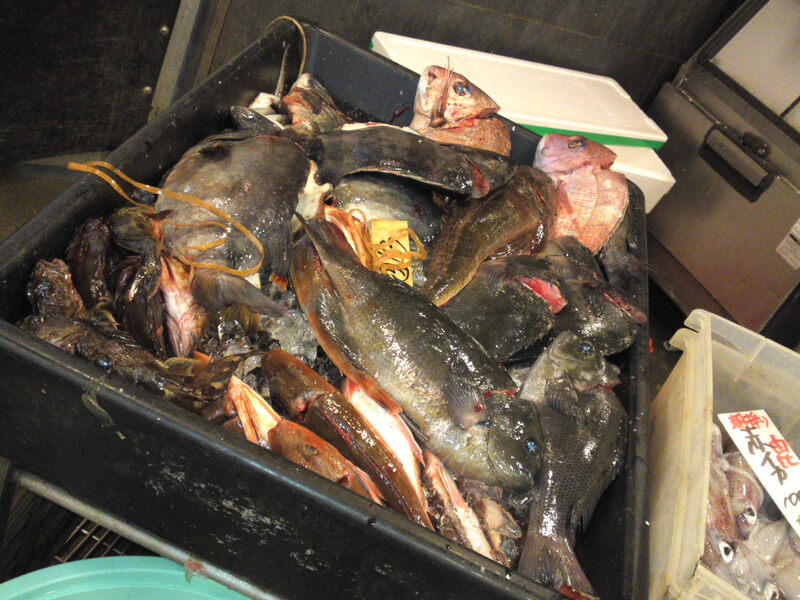 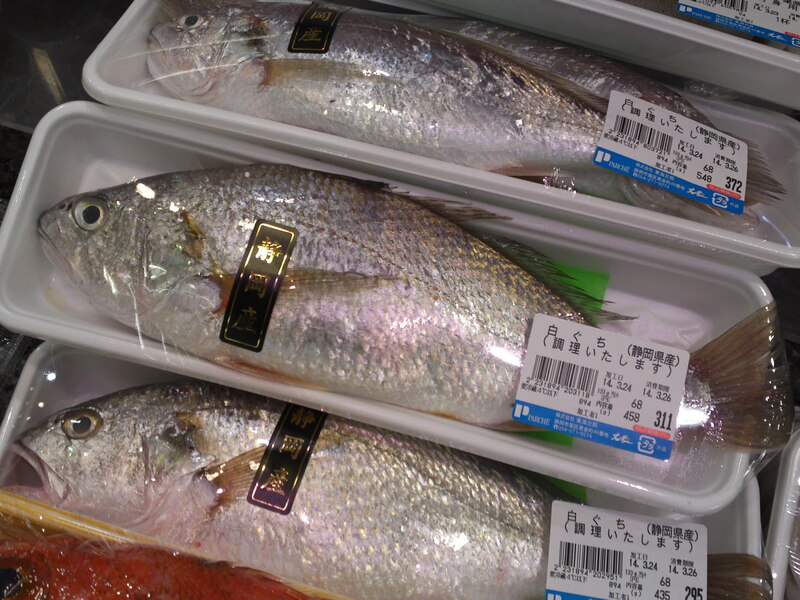 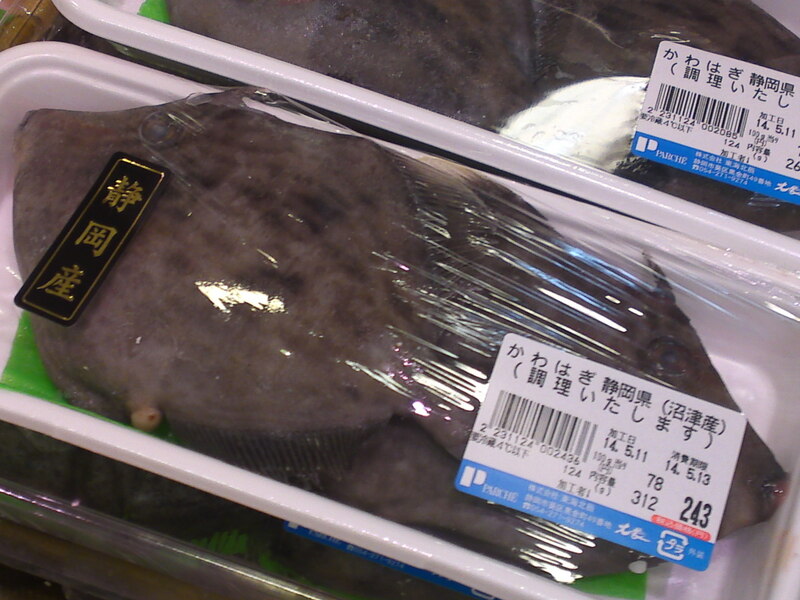 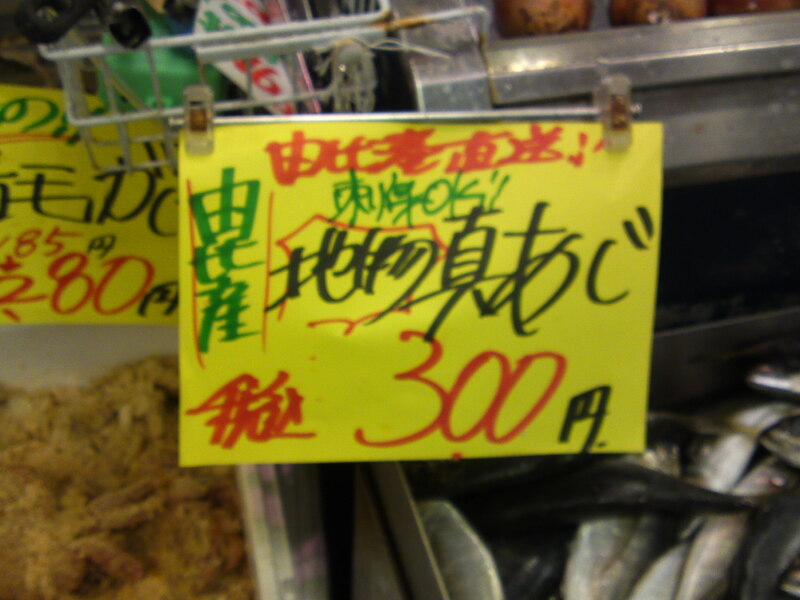 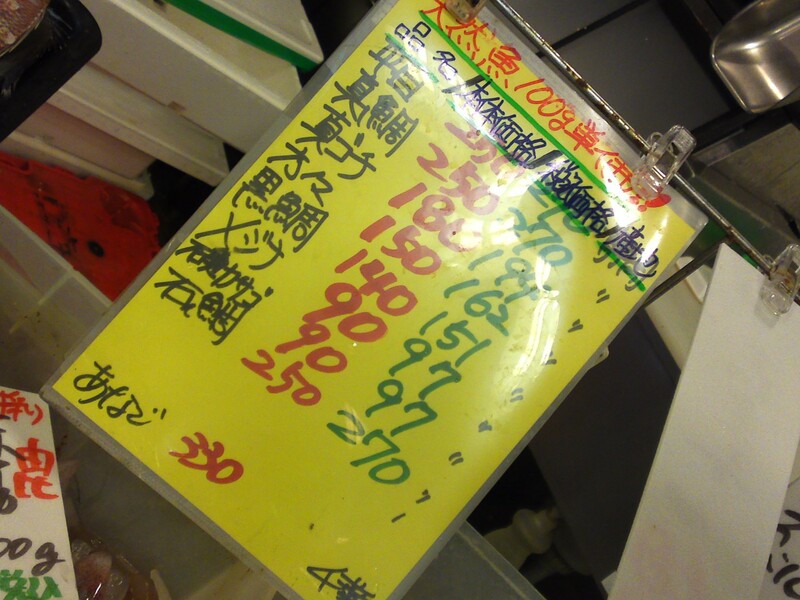 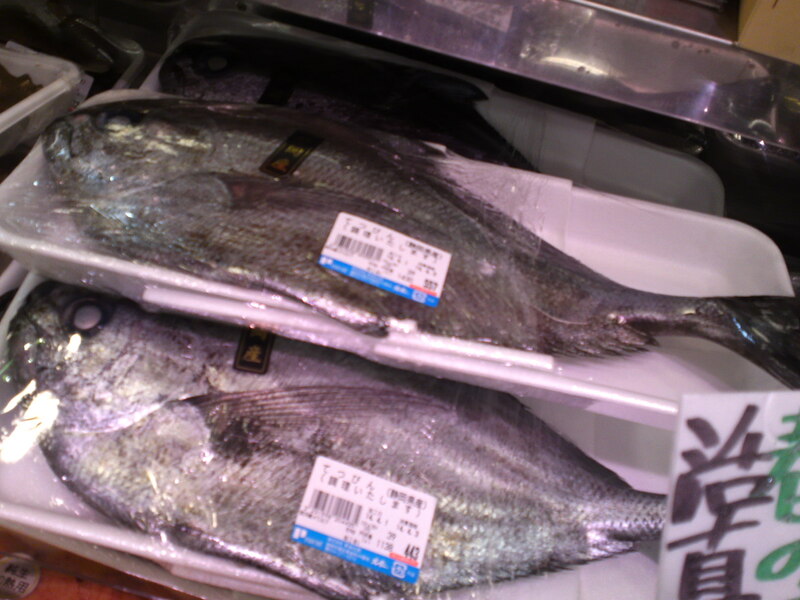 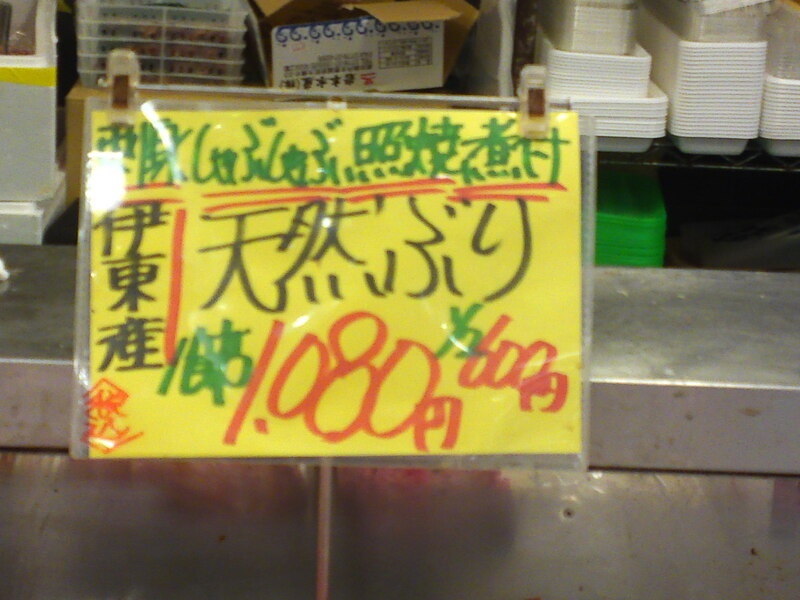 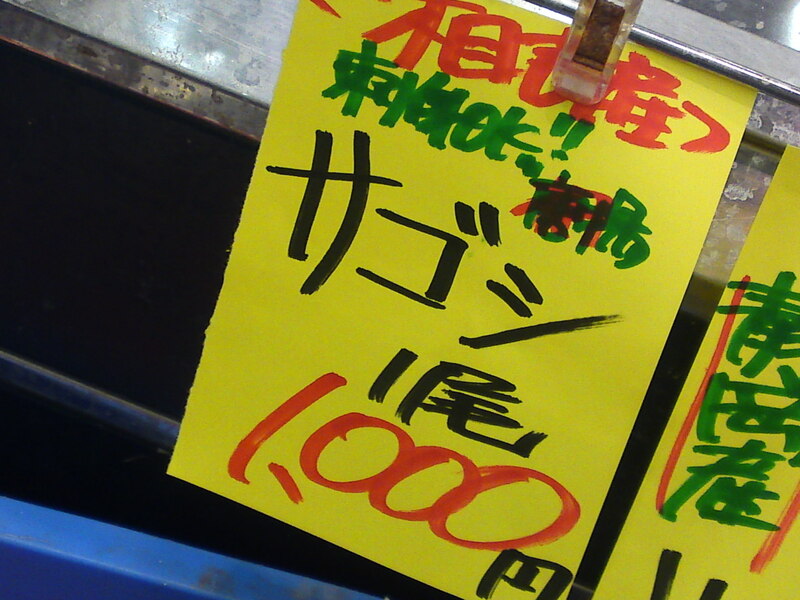 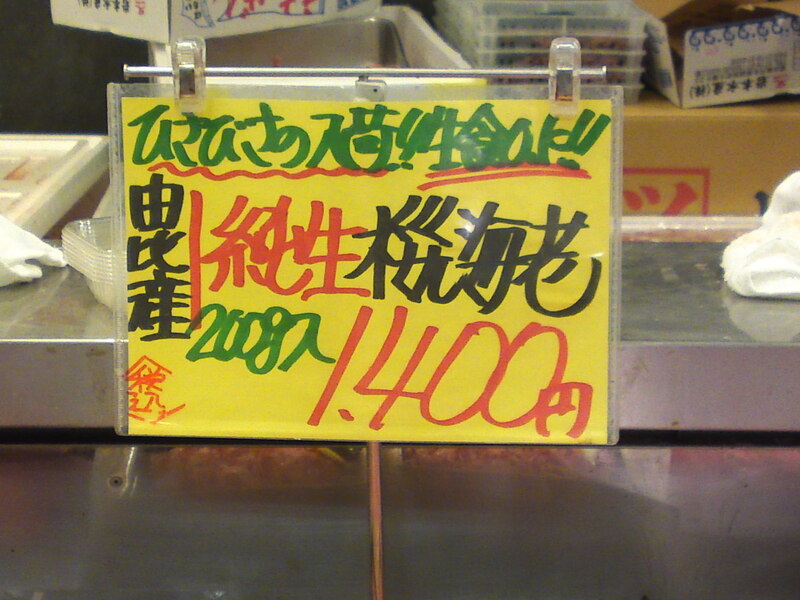 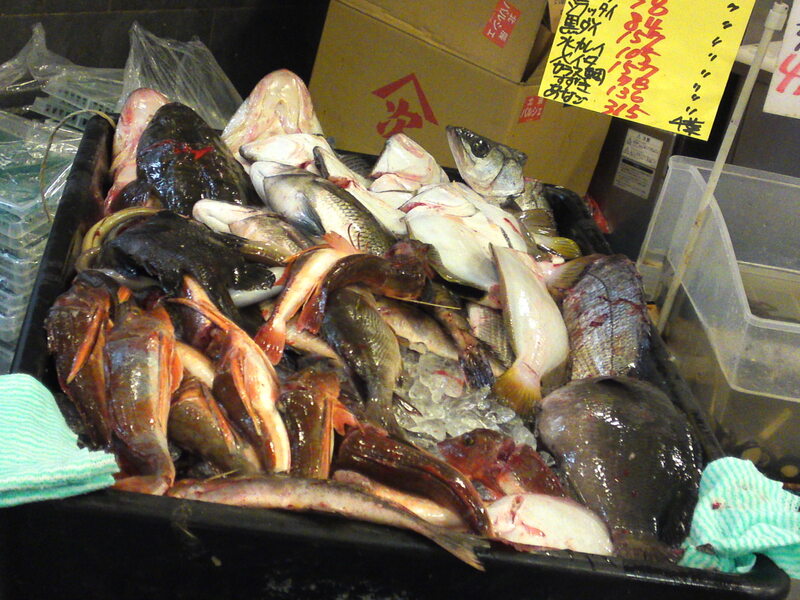 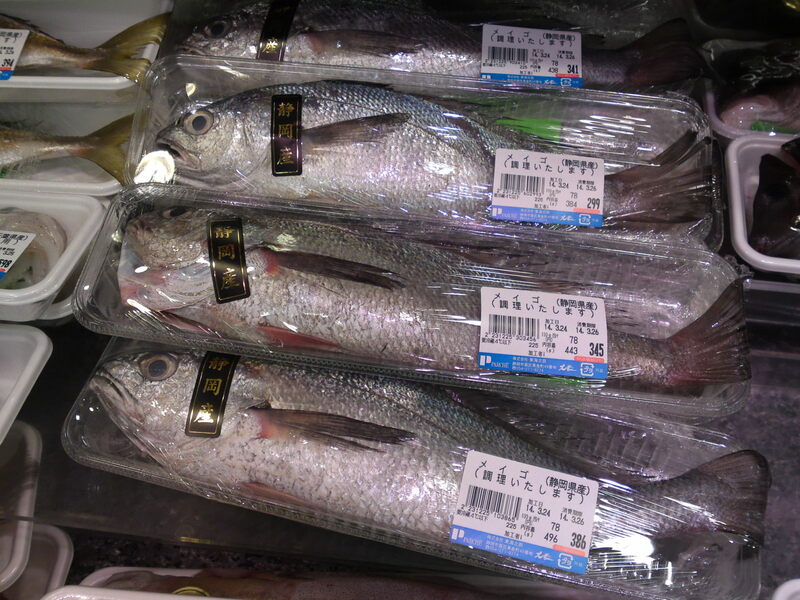 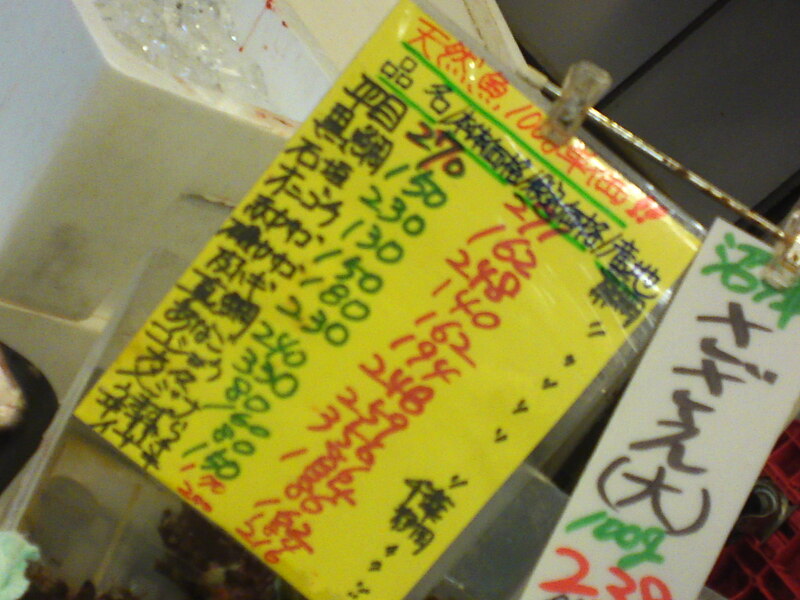 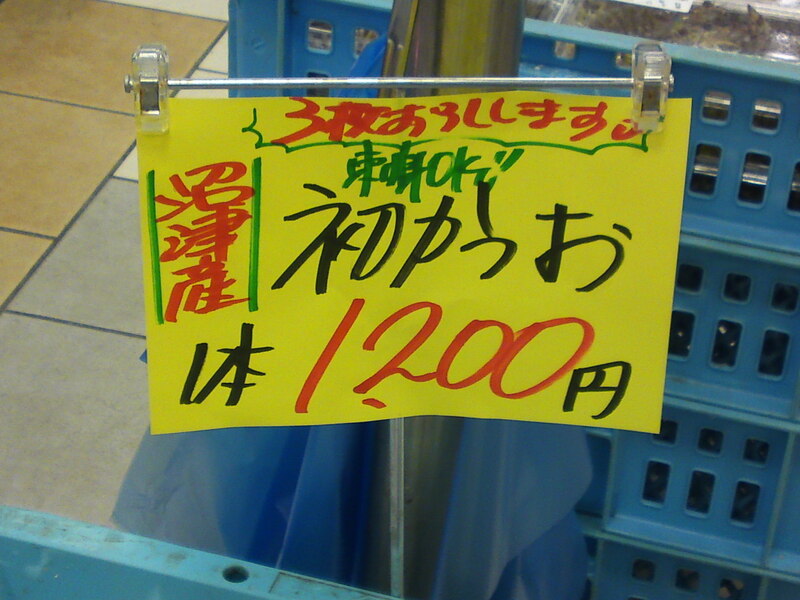 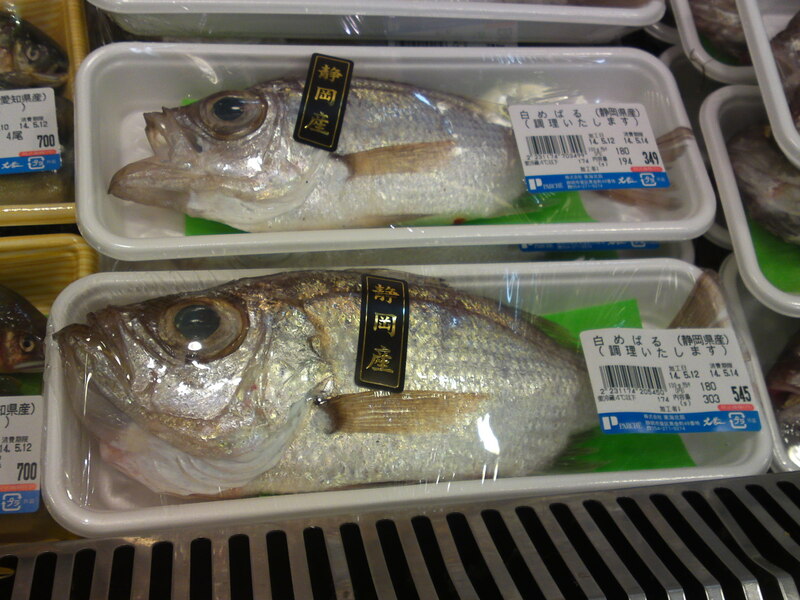 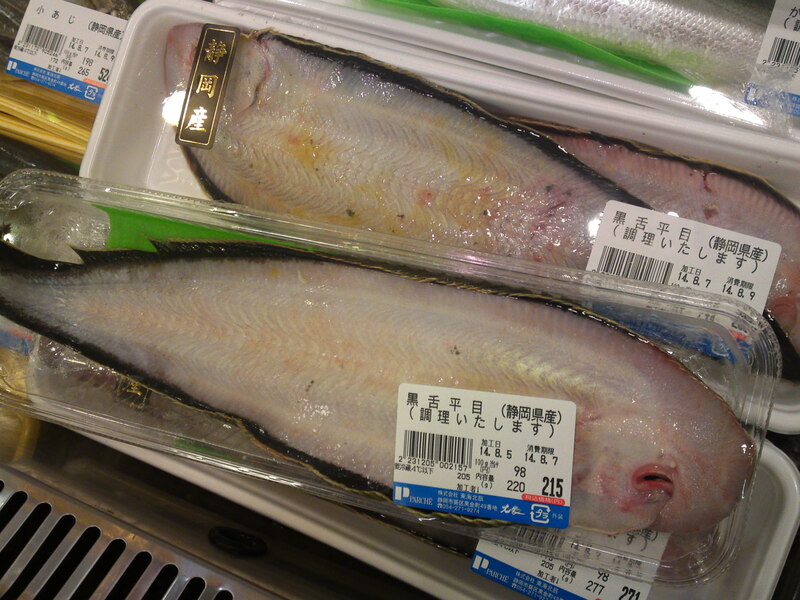 ), Shirattai seabream, Black seabream, Turbot, Meita seabream, Karasu seabream, Black bass, Conger eel! 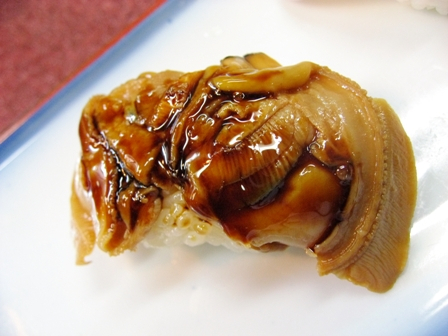 A delicacy marinated in vinegar here! 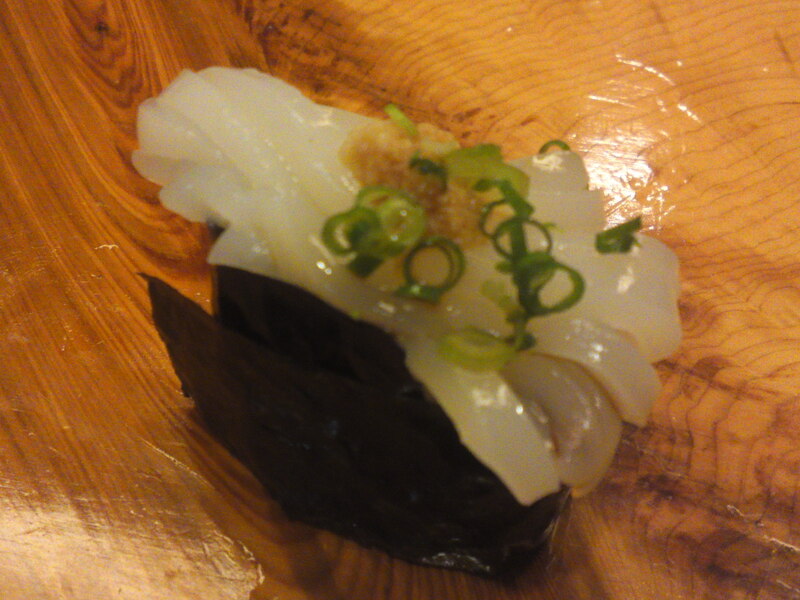 From Yui, Shimizu Ku, Shizuoka City! 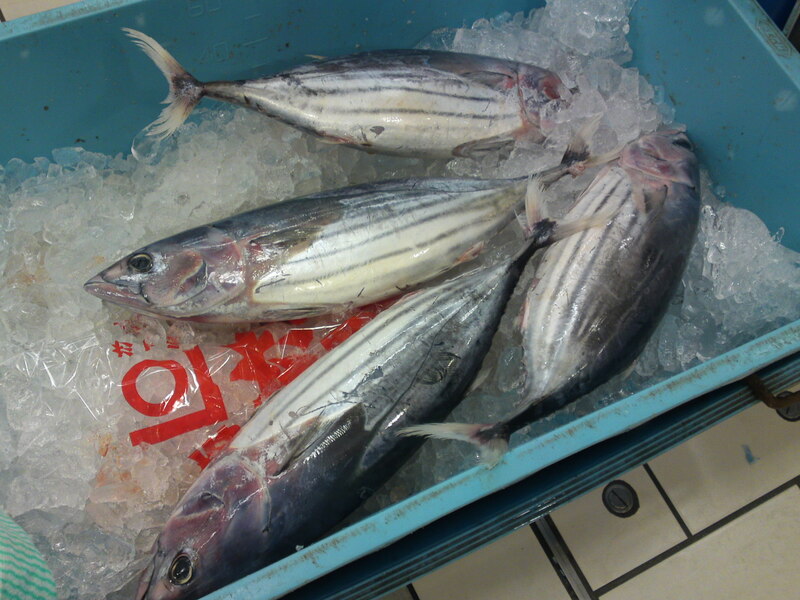 The splendid Alfonsino are from Shimoda City, Izu Peninsula and the mackerel from Numazu City!